Welcome back to Christmas-time in Harajuku! 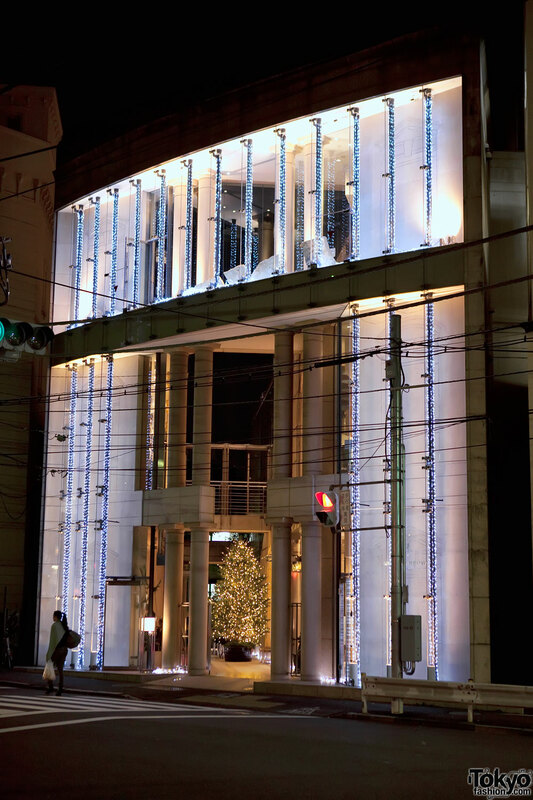 This will be our second holiday photo outing in one of Tokyo’s most fashionable neighborhoods. 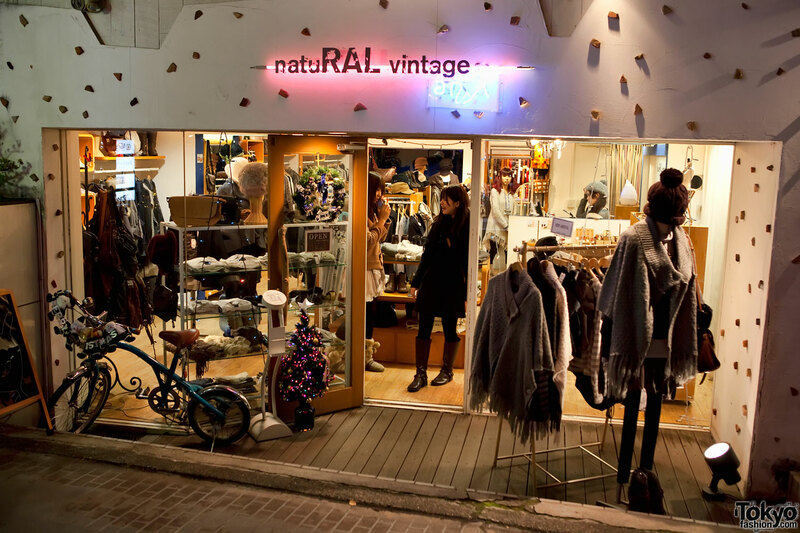 Our first Harajuku photo walk covered Takeshita Dori and Meiji Dori. 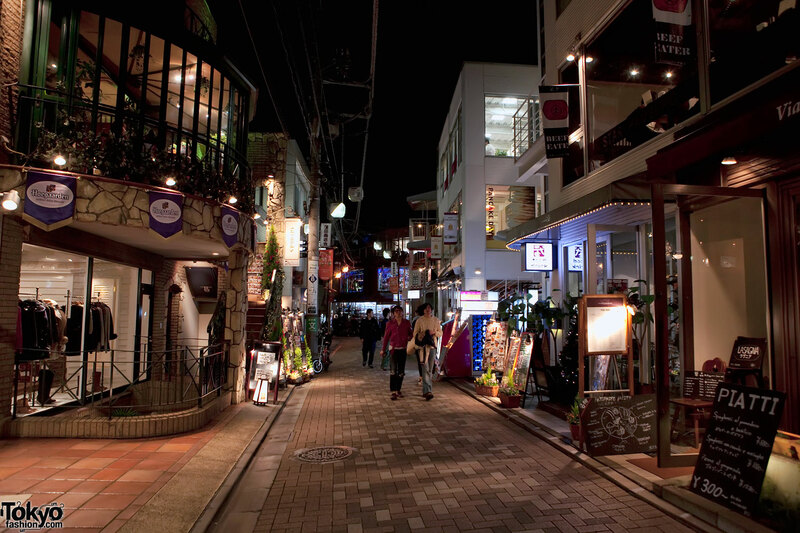 This time, we’ll wander around the back streets of Harajuku (Ura-Hara) and traverse the length of Cat Street. Harajuku has many back streets, so get ready for some serious zig-zagging, backtracking, and map-checking. You could walk around Harajuku all day and all night and still miss a lot of cool things, but we’ll do our best – GANBARIMASU! 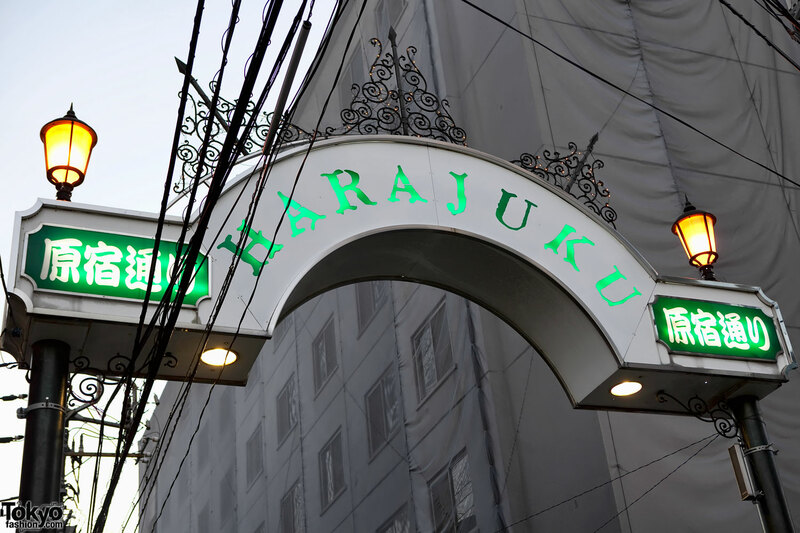 We’re going to start our second Harajuku photo walk sort of where we ended the first walk. If you remember, we stopped last time at the intersection of Meiji Dori and Takeshita. 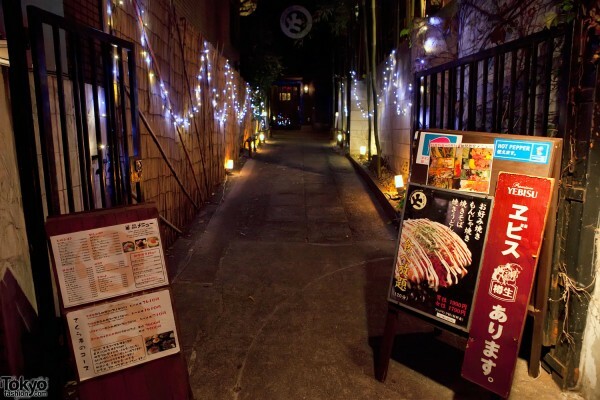 We’ll start this walk a bit further down Meiji where it intersects Killer Dori. 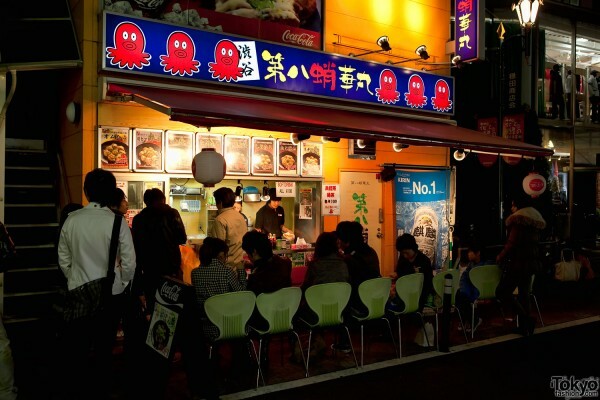 (BTW, if there’s a street with a better name than Killer Dori in Tokyo, I don’t know about it.) Diesel Harajuku is on the corner of Meiji & Killer. 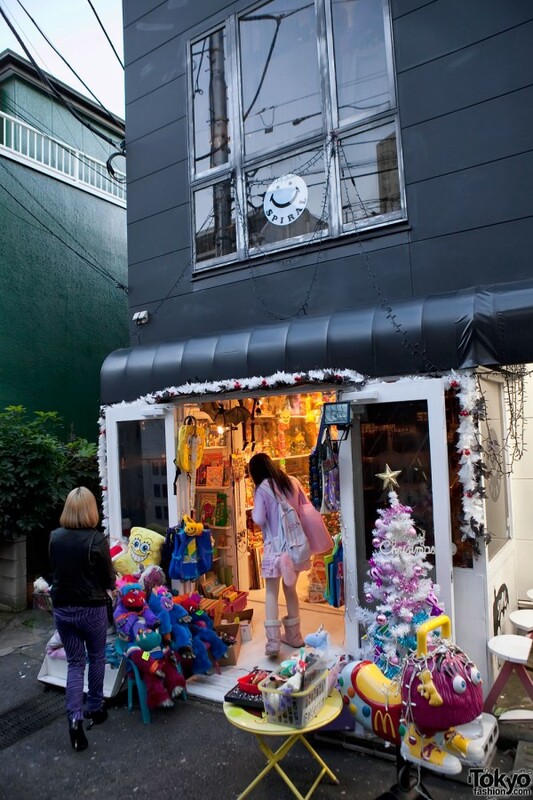 That’s pretty close to the northern border of Harajuku. If you were to continue north past Diesel (in the direction of Shinjuku), you’d find yourself in Sendagaya pretty quickly. Setting out from the north border of Harajuku, we’ll zig-zag furiously (I mean quickly, not angrily) around the back streets, then make our way across Omotesando Dori. Eventually, if all goes as planned, we’ll reach the south border of Harajuku – maybe even step into Shibuya briefly – and then make our return trip walking the entire length of Cat Street. As usual, please click on any of the pictures to see them in super high resolution! If you’re ready and willing, let’s get started. Time. To. Walk! 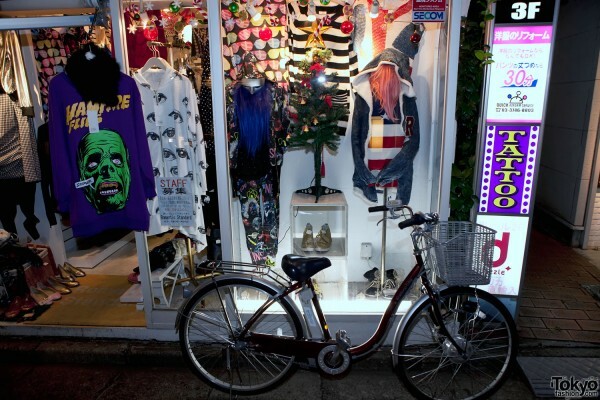 Our first Harajuku photo of the night! 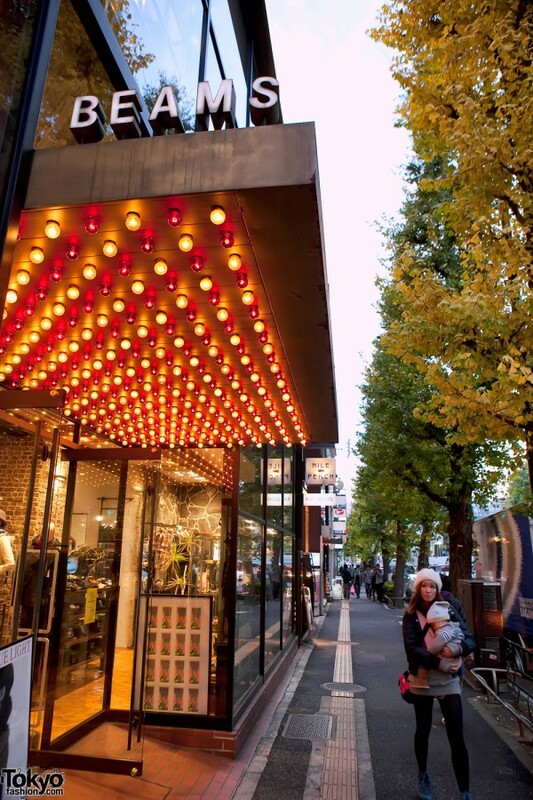 This is Diesel Harajuku – a landmark store located on the corner of Meiji Dori and Killer Dori. 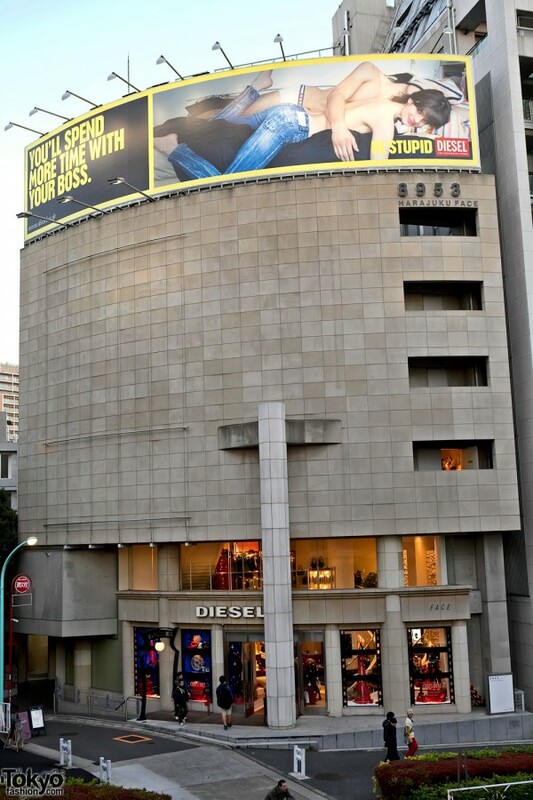 Until the new Diesel Shibuya opened last month, it seemed like this Diesel shop was the most famous one in Tokyo. How the mighty fall. 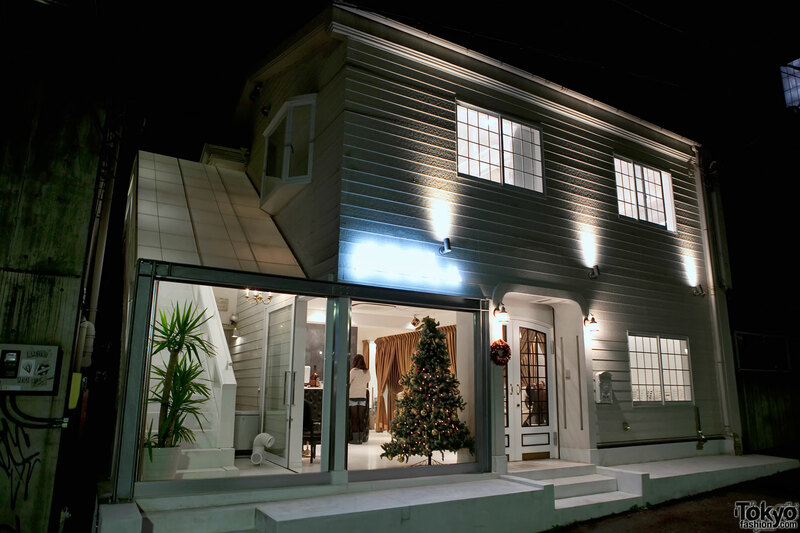 Well, not really, but the new one does have an art gallery and cafe. This one still has lots of denim, though! Unfortunately, you have to cross over a pedestrian bridge to quickly get from Diesel to Beams Harajuku. Why is it unfortunate, you ask? Because climbing stairs is a lot of exercise this early in the walk! Anyways, this is Beams Harajuku. 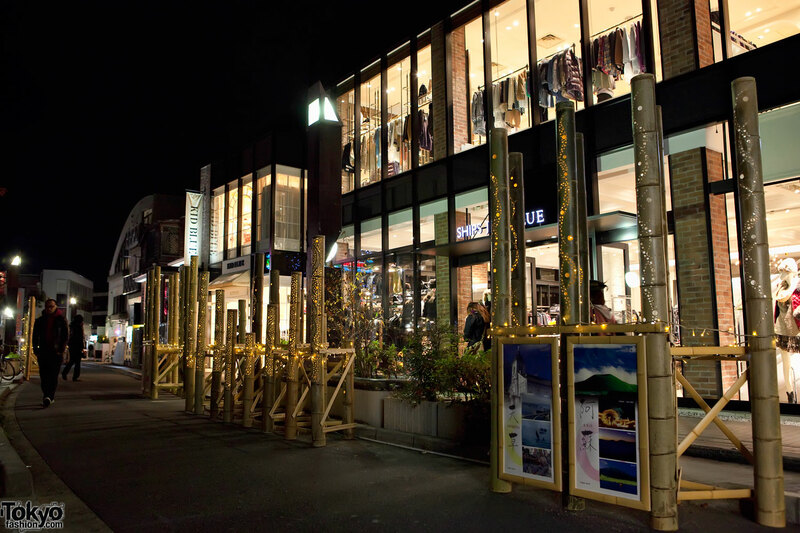 Actually, there are about seven different Beams stores in this little area along Meiji Dori. 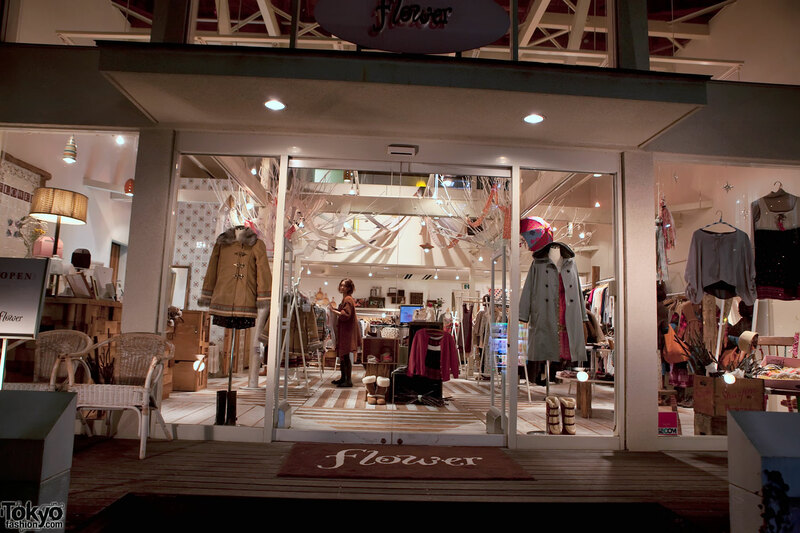 If you visit Harajuku, don’t miss Beams. It’s cool. Shame they didn’t do more for Christmas this year. Now we’ve backtracked slightly to the street that runs parallel to Meiji Dori but on the other side of the Beams buildings. This street is the location of the famous Dog boutique. Wandering along this street and all of its little side streets, we find the Spiral second-hand store. You can find all kinds of strange things in this shop. There is a girl in pink, possibly Fairy Kei style, looking around out front. 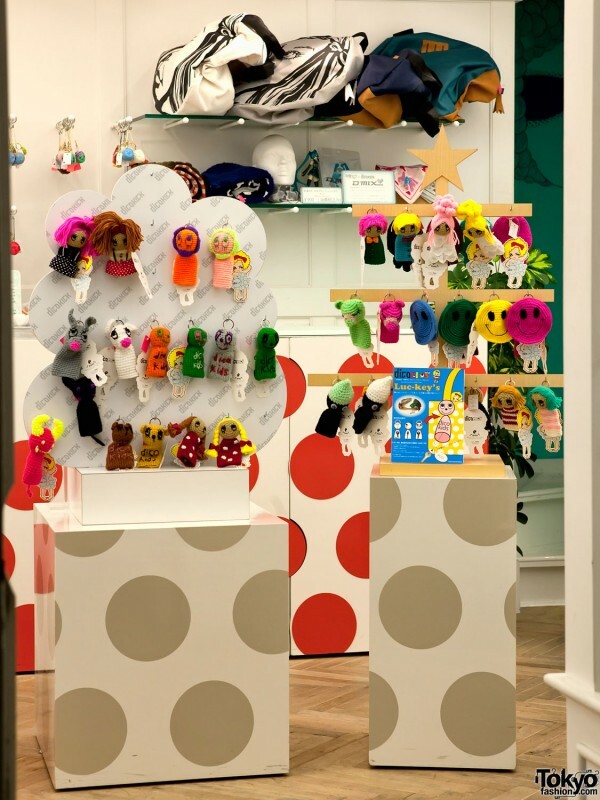 If you’re one of those people who likes to attach vintage stuffed animals to your outfit (you know you want to) or if you’re looking for some 1970s McDonald’s signage, this just might be your shop! 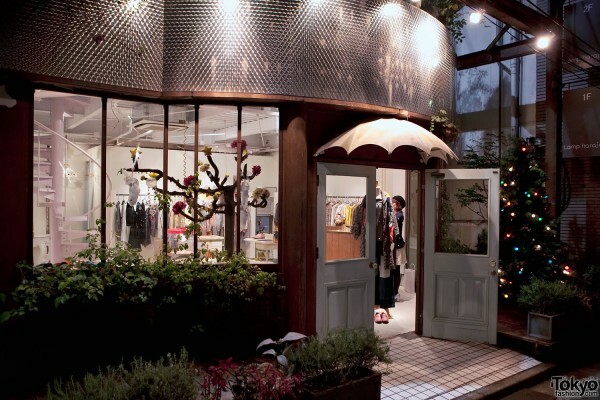 This is the Spell Harajuku shop. 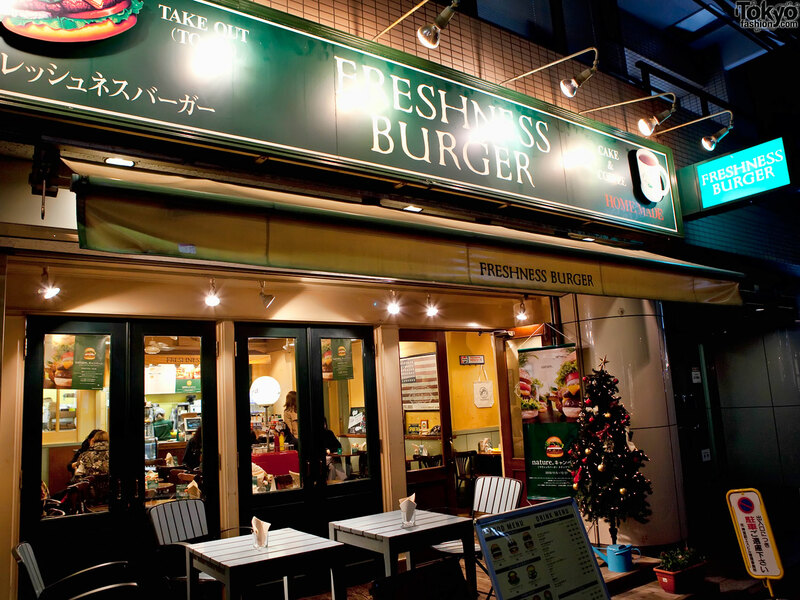 A few months ago They moved to this location from their previous location on Meiji Dori. Baby Soul Harajuku. Their palm tree is eating their Christmas tree. 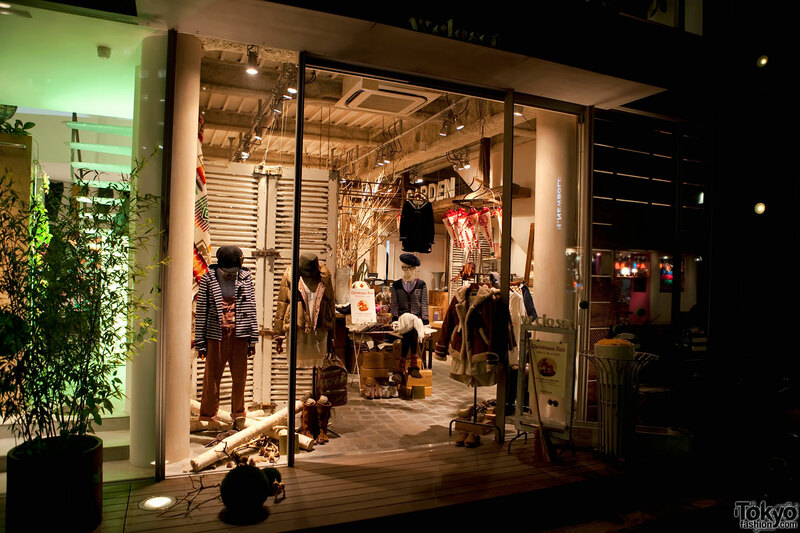 This is Beams-T Harajuku. Like UT and Graniph, they sell limited edition graphic t-shirts. 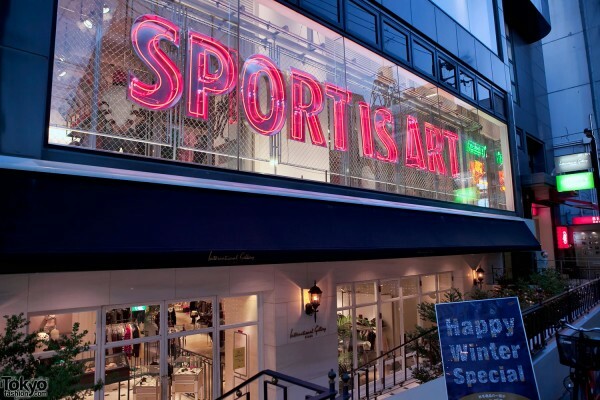 The huge neon on the window right now says “Sport is Art”. Not sure I agree, but I like neon. The cute florist shop on this street is where I have bought mini-Christmas trees, pumpkins at Halloween, and flowers to brighten up Tokyo Fashion HQ. 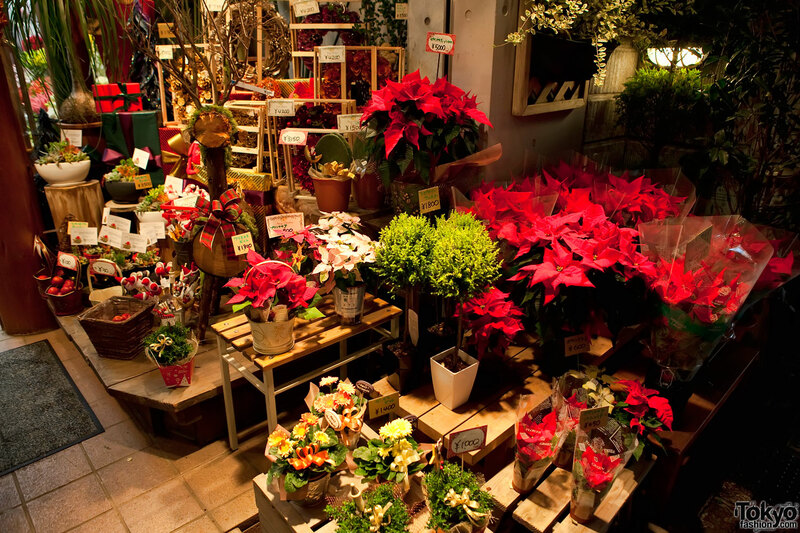 They are selling pretty poinsettias for the holidays. LA Avenue or Hug Oh? Decisions, decisions. A cute Harajuku hair salon with Christmas lights and flowers in the window. 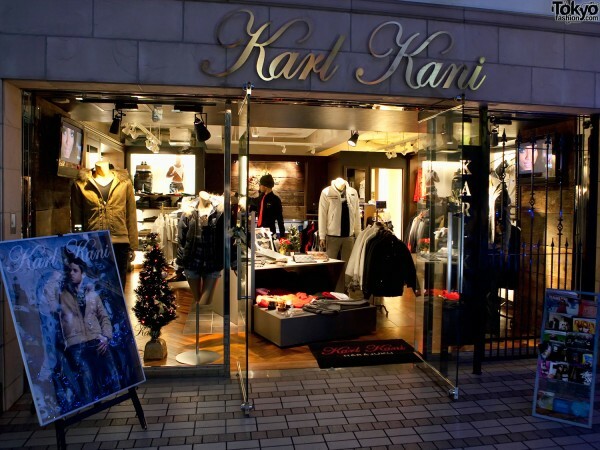 Karl Kani Kristmas Tree! This is not a Japanese brand. 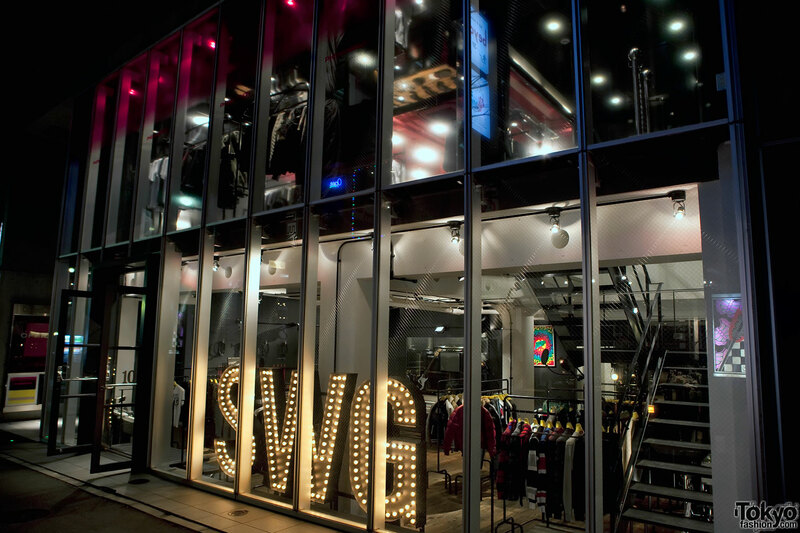 It’s an old-school American hip hop fashion brand that has worked with Dr. Dre, Snoop Dogg, and even Tupac. Word. Hypercore Harajuku has cute Christmas artwork and Gremlins in the window. Before we could take this photo, we had to ask these guys if they could move out of the way for a few seconds. Turns out that one of the guys is the main designer for Hypercore. He was a really nice guy – and he let us take the photo! 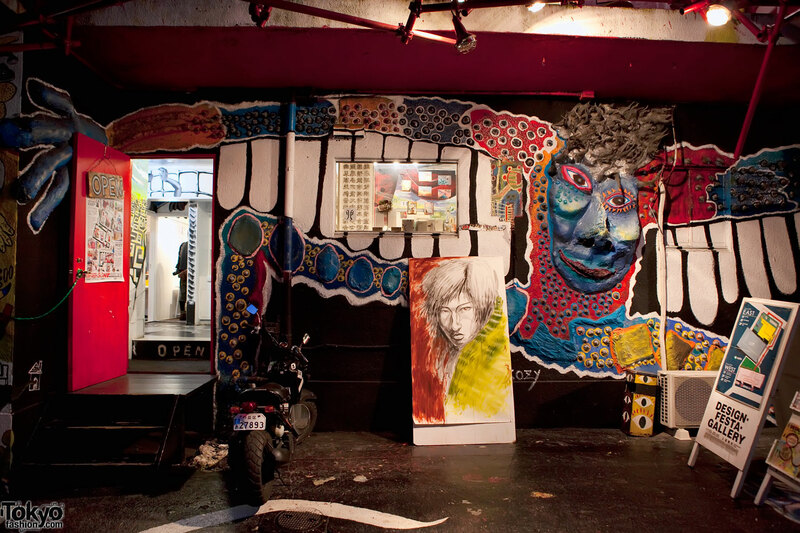 The famous Design Festa Gallery. 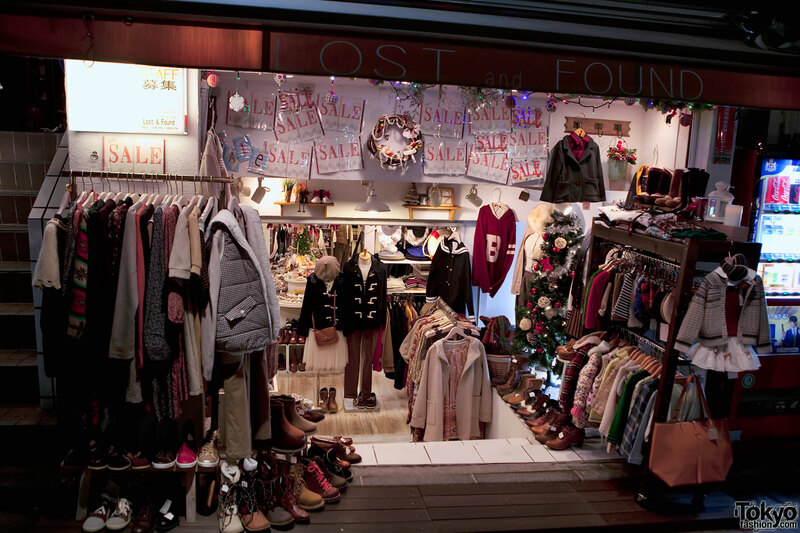 It’s not really decorated for the holidays, but Design Festa always looks cool. 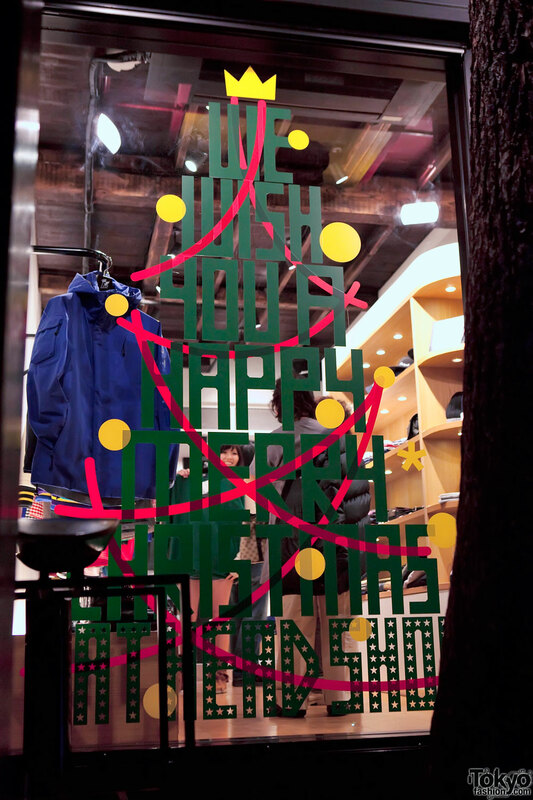 “We wish you happy merry Christmas at head shop” in the window of the FAT Clothing head (“head” as in “headquarters”) shop. 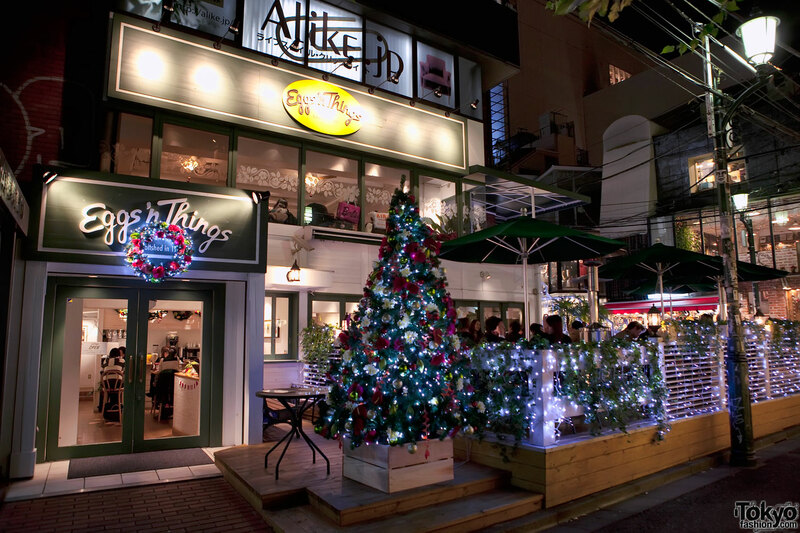 Christmas lights leading to a little Harajuku cafe. Okay, now we’ve made our way down toward Omotesando Dori and we’re bouncing around in this area. 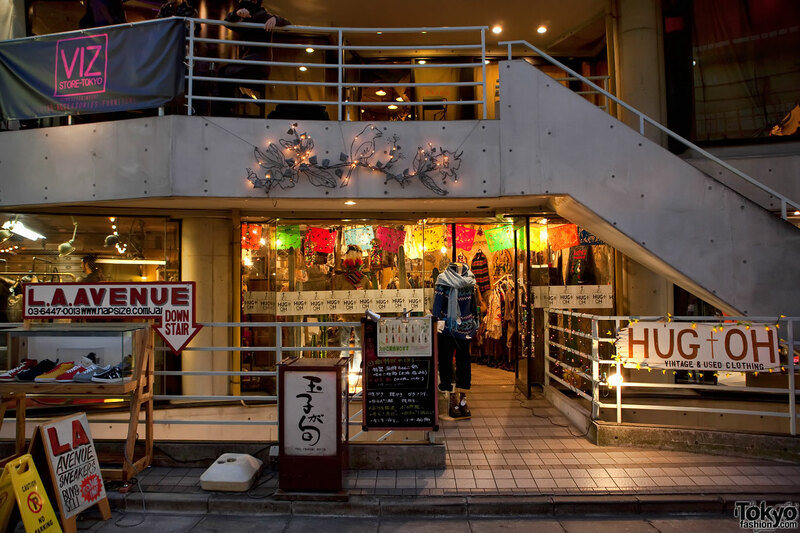 Again, this entire part of Harajuku is made up of so many little streets that you can just crisscross and zig-zag and find all kinds of things. This is the Eggs n’ Things restaurant. It always has a long line out front. I’ve eaten there only once. They serve eggs. And things. 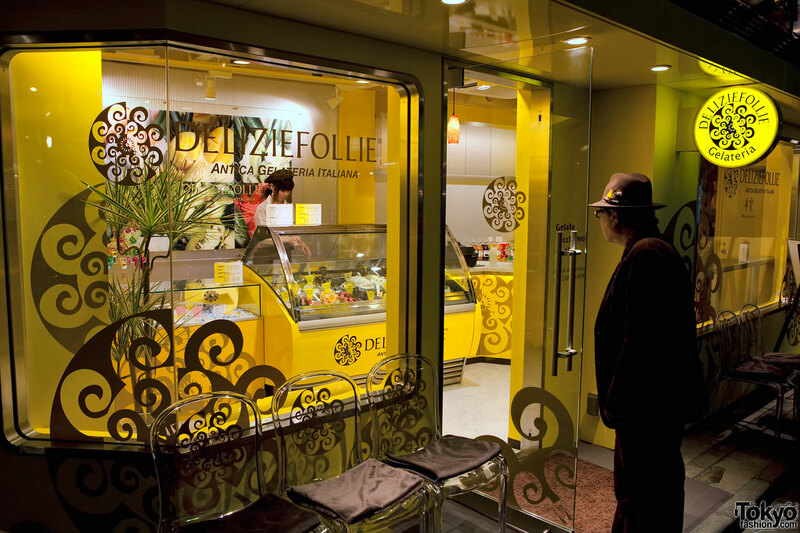 Across from the ice cream shop is Yellow 96. 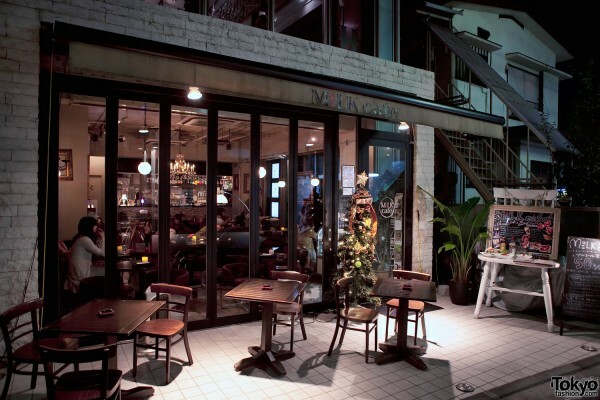 But, more importantly, upstairs are our friends 6%DOKIDOKI. If you go to Harajuku, don’t forget to stop in and say “HELLO!” to the 6%DOKIDOKI crew. They are so friendly! Lamp Harajuku has a Christmas tree out front and a strange-looking tree inside. This is a sad picture, even though it doesn’t look sad. Why is it sad? Because the Hangry and Angry shop closed down a few days ago. 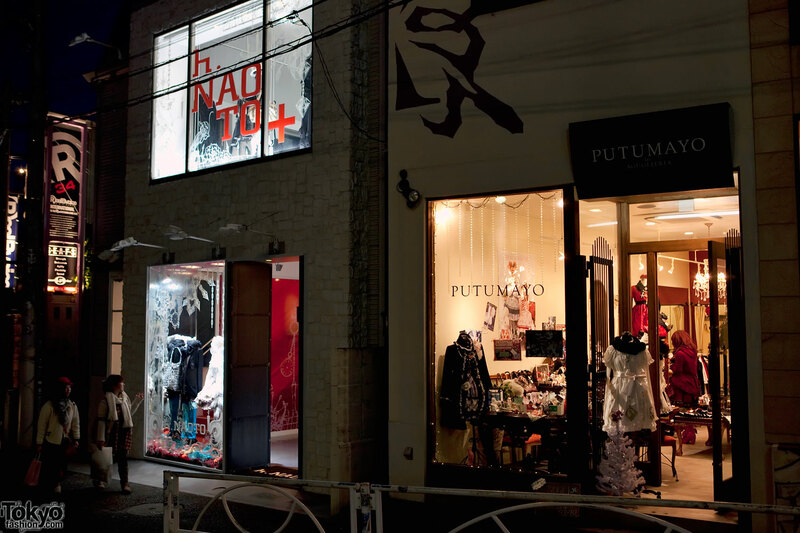 Now that H.Naoto has a new space on Cat Street (we’ll pass by there later tonight), I guess they don’t need this shop. Bye Hangry! Bye Angry! 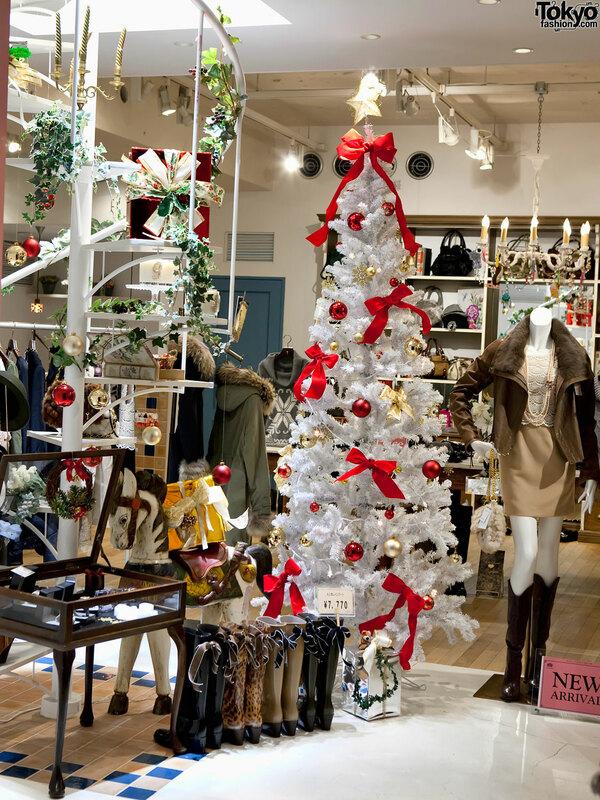 Hiyori Harajuku has a Christmas tree inside of their shop. It’s so far inside, you probably need to blow up the photo to see it. Sorry – I’d bring a zoom lens, except that it would be so heavy. 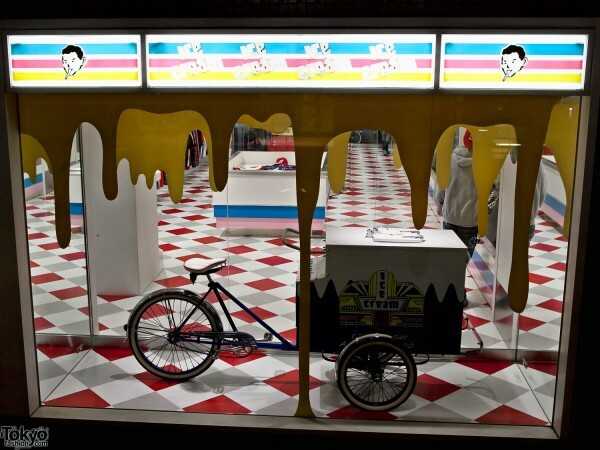 I want to start one of those useless online petitions to protest BBC Ice Cream’s refusal to change their front window display. I think maybe it’s been the same since they opened? How about putting Santa on the bike next year? No? Okay. Next! 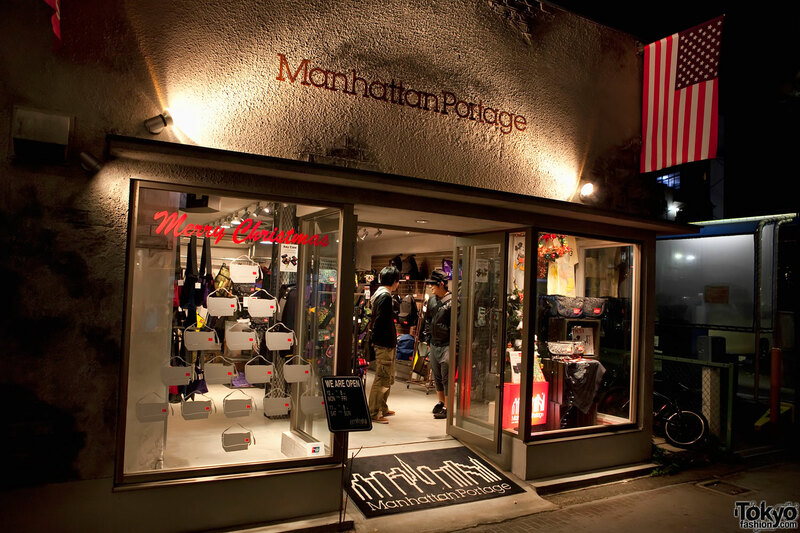 Jack Rose Harajuku. 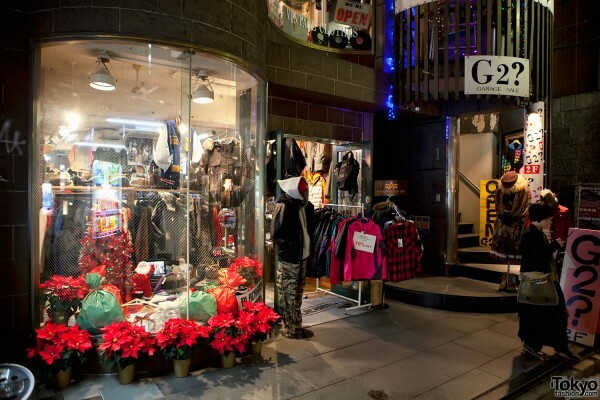 Get your gyaru-o Christmas gear here. 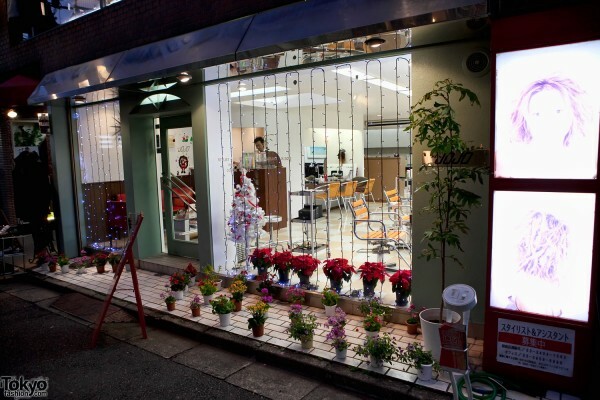 Another florist with pretty flowers? That must mean that we’ve made it all the way back to the street that continues on from Takeshita Dori, along the side of the KDDI building. A girl in red (that’s a Christmas color, right?) inside of the ANAP shop which opened sometime in the last year or two. G2? 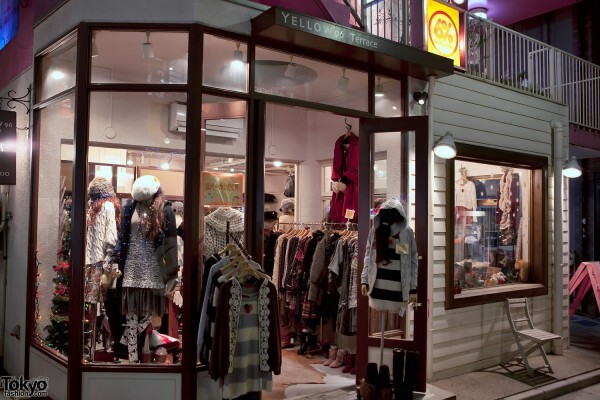 Harajuku. 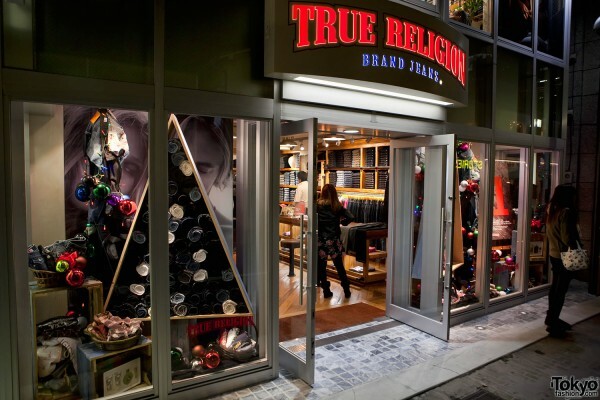 This shop is a little famous with hipsters. Check it out if you’re in the area! 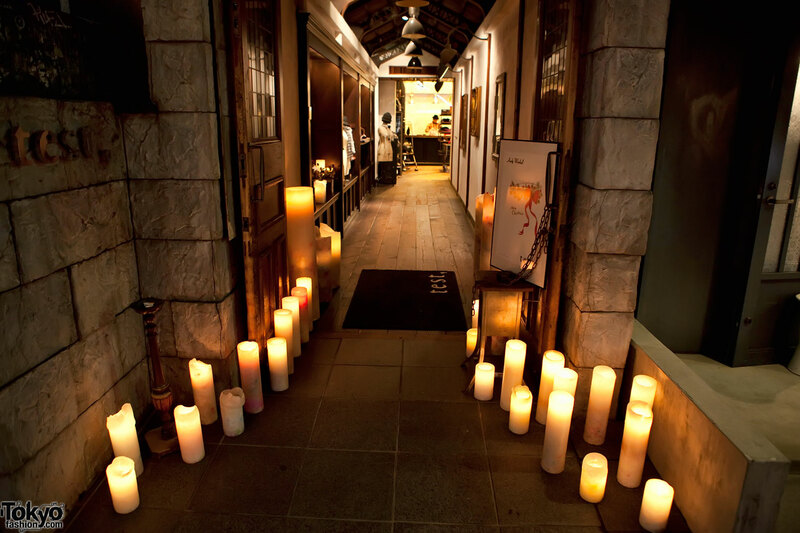 Test Harajuku with some really awesome candles out front. I feel like just chilling here for a while. But I don’t have time. On we go. 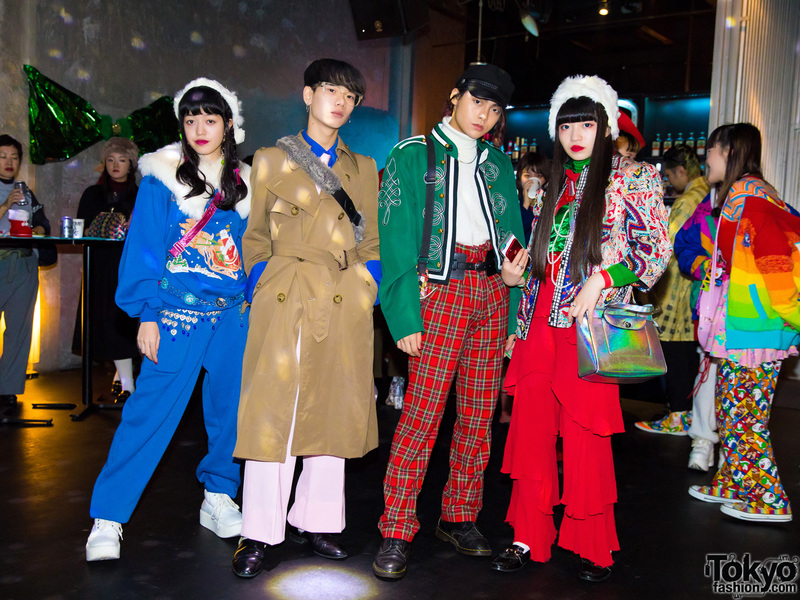 Nadia Harajuku. This shop is loved by girls all over Tokyo – especially girls who like platform Converse high tops. 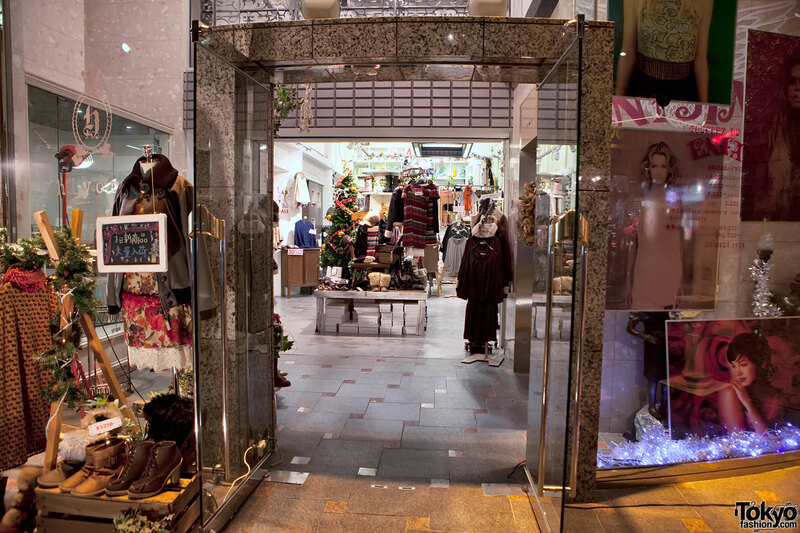 And, I hear the shop staff here is very friendly. Stop in and say hello! 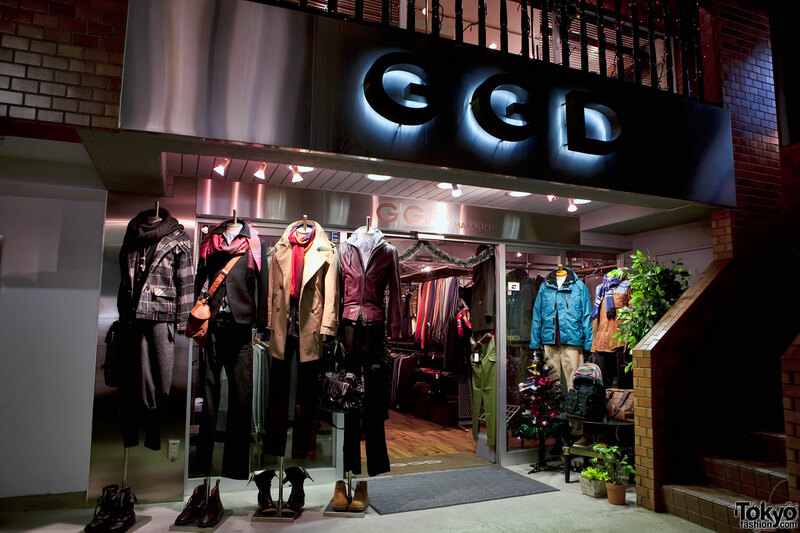 GGD. Boys, this one is for you! A little Christmas tree. A horror sweater. A bike. 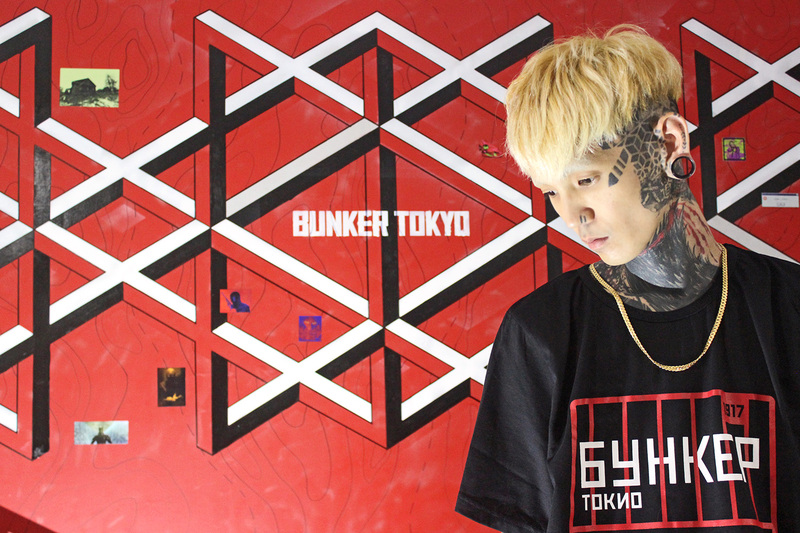 Tattoos. Etc. Romantic Standard – for the mori girl in every one of us. Even the holiday wreath is earthy-white colored and layered. 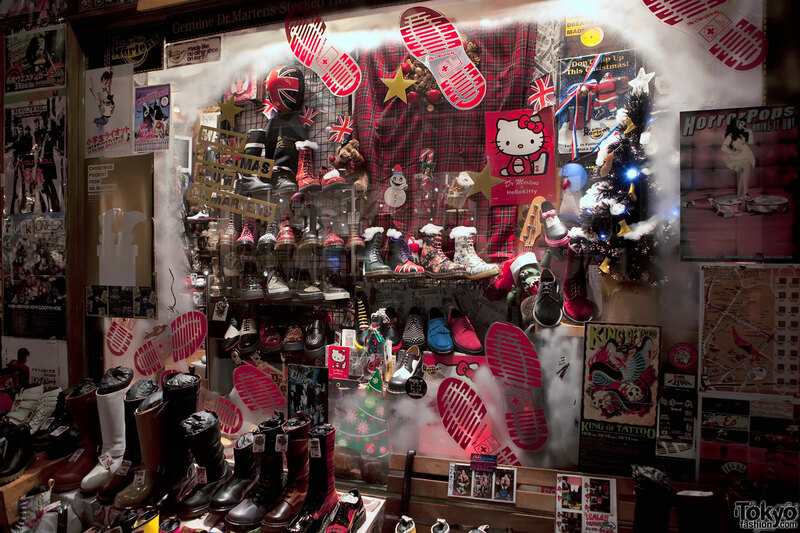 Dr. Martens Harajuku – the means are we are moving toward Omotesando Dori again. Back and forth we go. Pool Harajuku. I think it’s some kind of day spa, but not sure. 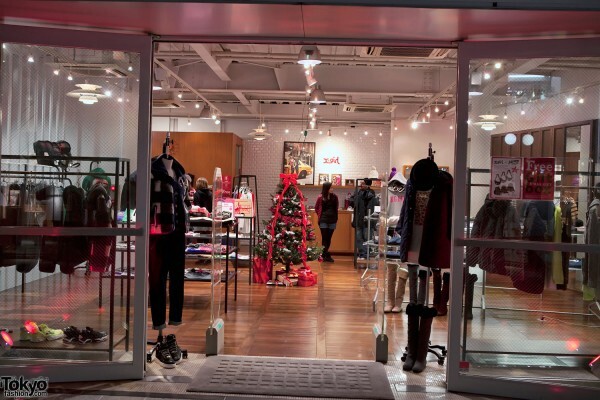 There is a Christmas tree inside of the Theater Products shop. I like this brand! 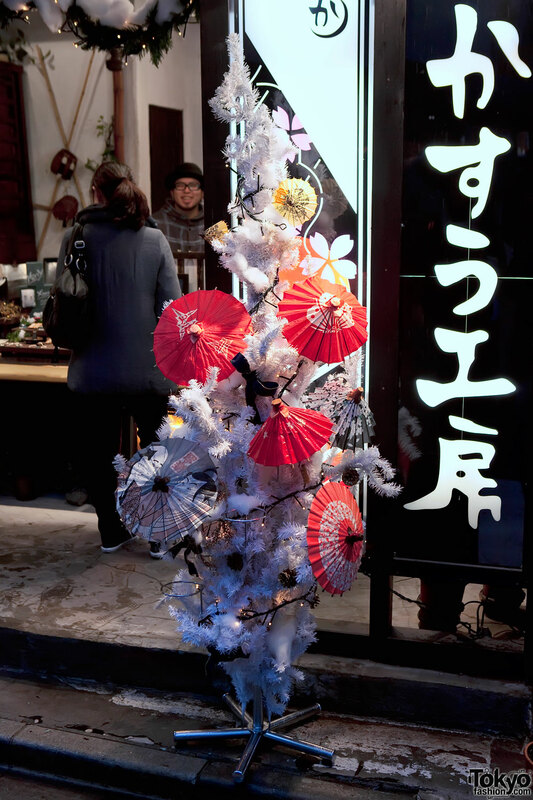 A little Christmas tree covered in traditional Japanese parasols at Kasuh Koubou jewelry store. Fun, but not as fun as the guy in the background laughing. Swagger and Phenomenon Harajuku – two cool shops in one building. Not much holiday spirit, though. Guess what? 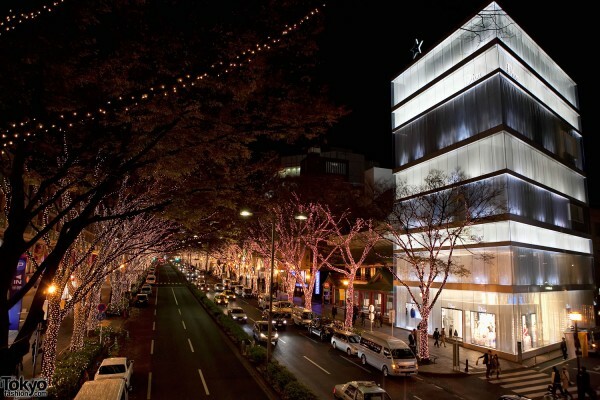 We’ve crossed over Omotesando Dori to the Shibuya side of Harajuku. Does that make you hungry? 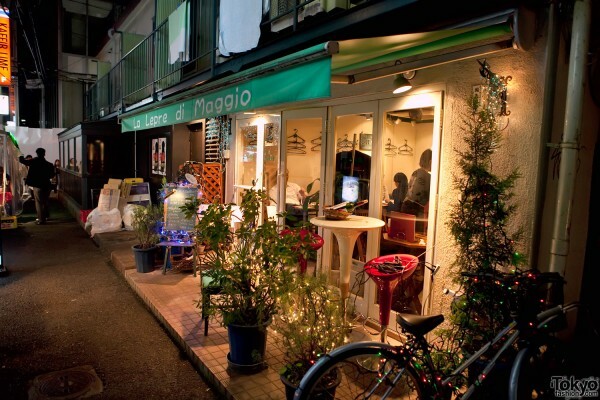 Here is a cute little cafe. A random street in Harajuku. People, shops, cafes, etc. Leopard print pillows and a very short Christmas tree at 12 by Nina Mew. 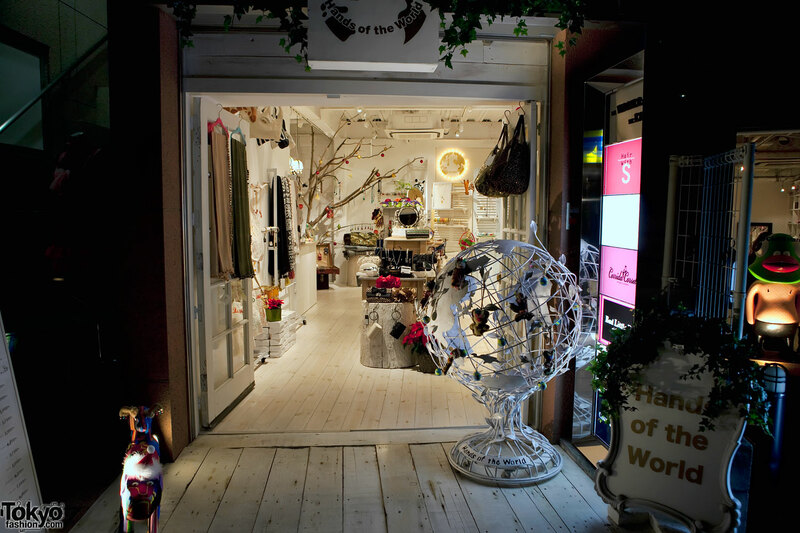 A giant globe outside of Hands of the World Harajuku. 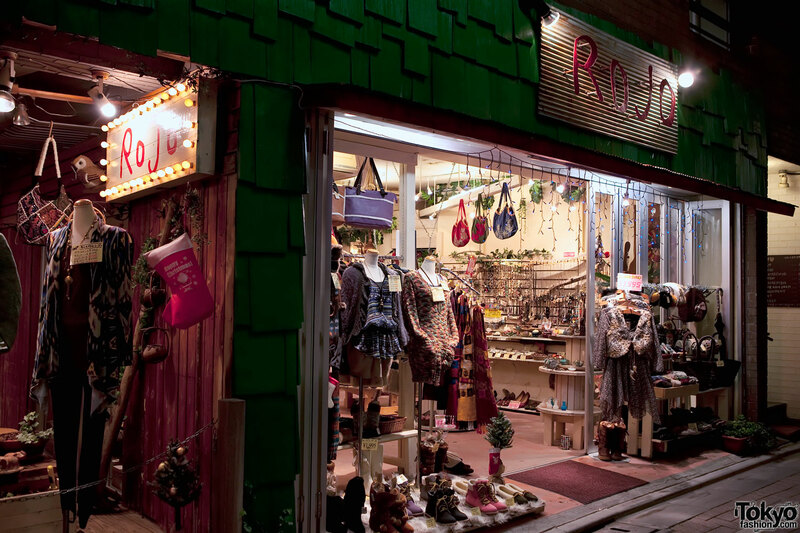 A Christmas stocking hanging on the wall of Rojo Harajuku. Okay, this tree is a sign (and there is no spoon). The sign says, “welcome to Cat Street”. That’s right, we’ve made it about halfway through our walk. 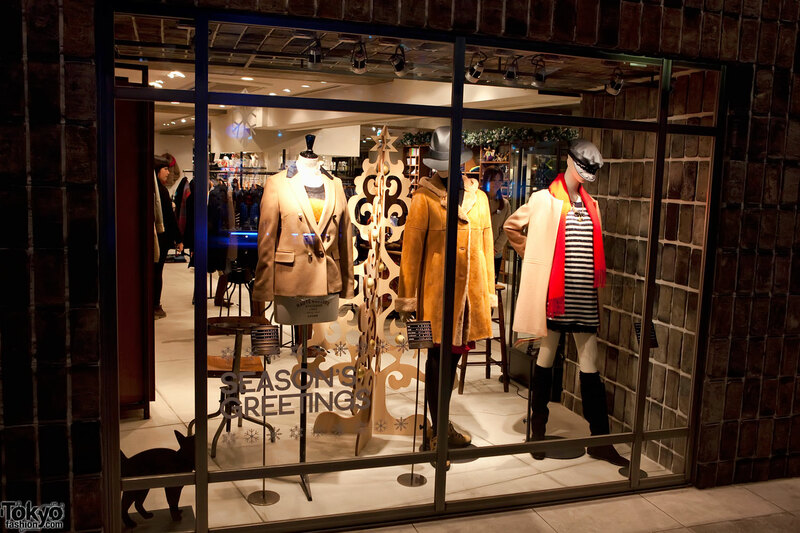 Now we’ll follow Cat as if we were going to Shibuya, then double back toward Omotesando. 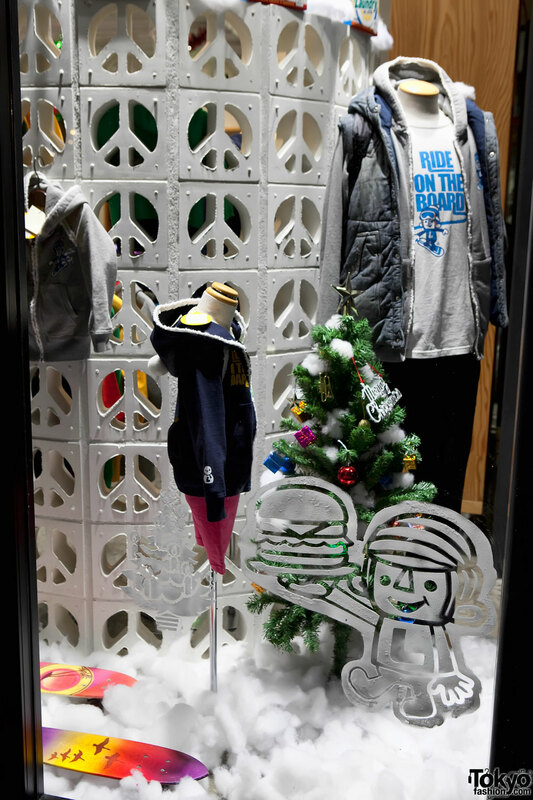 Here is another Cat Street Christmas tree, this one is right outside of Freak’s Store! 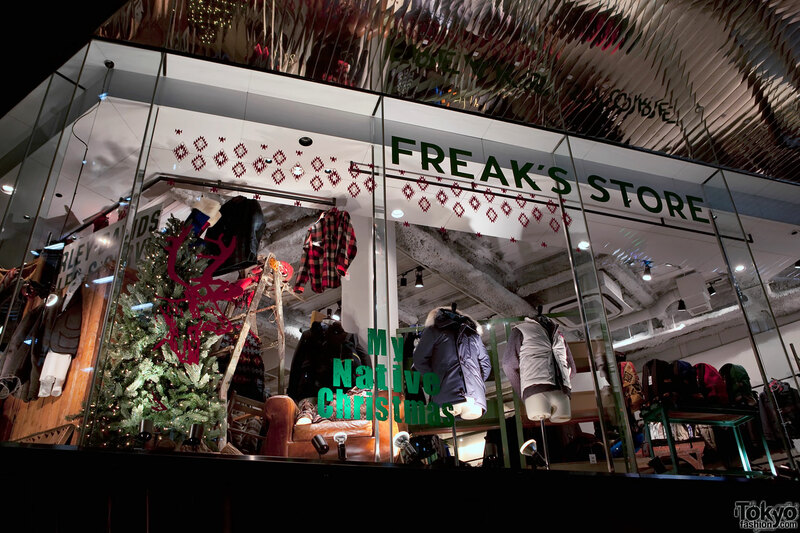 Freak’s Store is great about decorating for holidays. This Christmas, they are doing a Native American themed campaign called “My Native Christmas”. 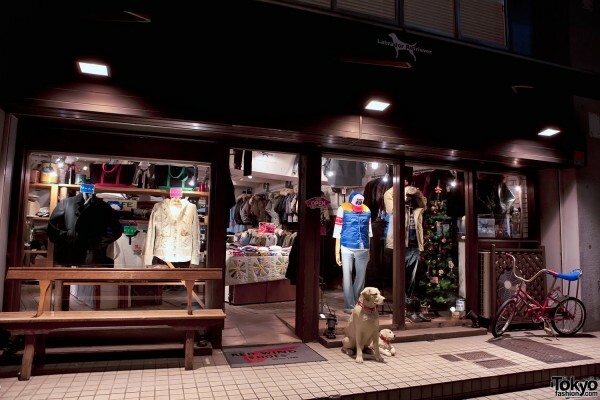 Labrador Retriever Harajuku is not a pet supply shop! It’s clothing. Everyday by Collex. That’s a subliminal message. Your brain reads it as, “Every day buy Collex!” Tricky. Is there anything in the world better than a Freshness teriyaki chicken sandwich? Of course there is, but still it’s pretty tasty. A very pretty Smacky Glam Christmas tree. 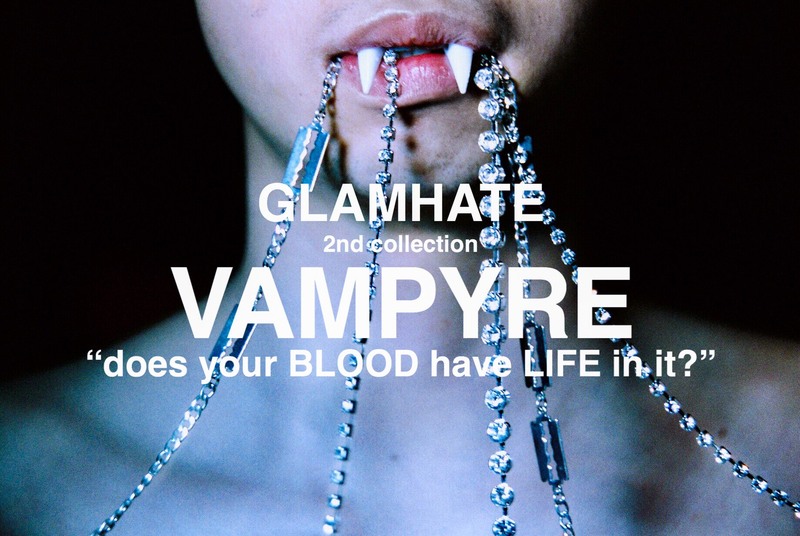 Not sure how this brand got its name, but I’ve loved it since I first heard it. 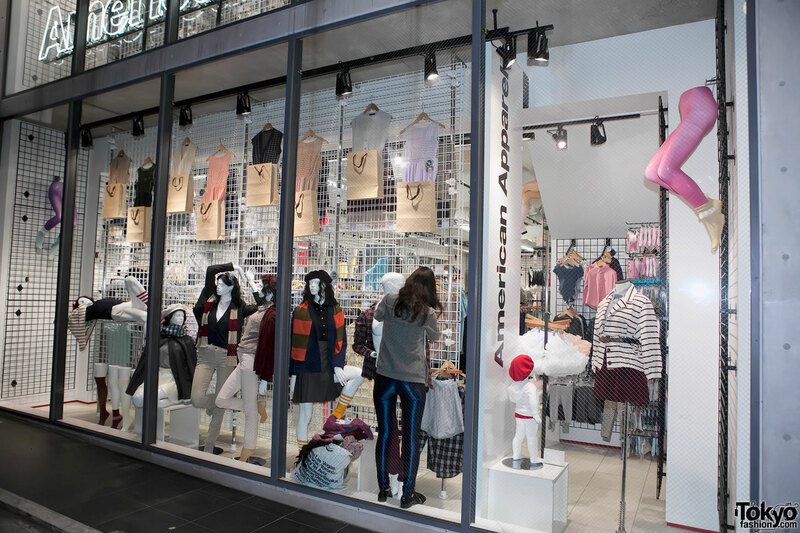 AmeApa – that means “American Apparel” in Japanese. 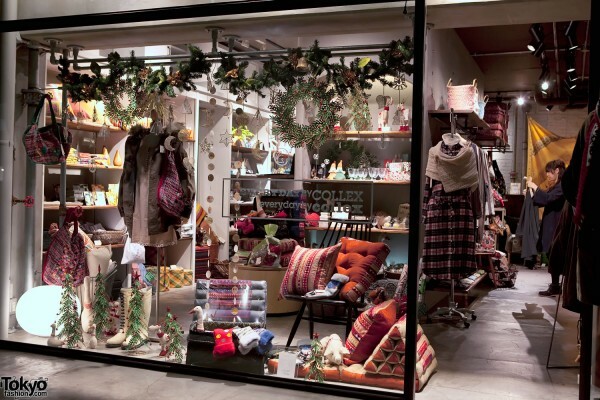 Strangely, there is a real girl in the window. Mocha – plenty of cold-weather clothing for girls (and some Christmas decorations) here. 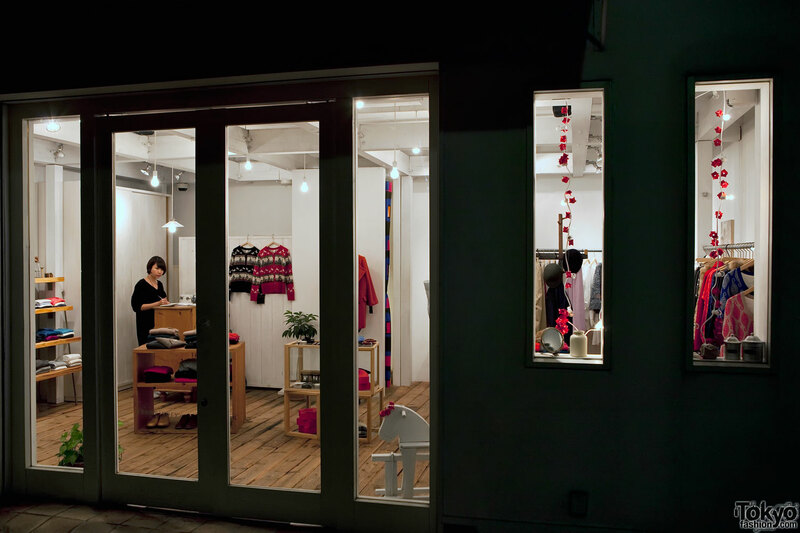 Loro – another Tokyo hat shop. Bonne Chance will help you get your bling on this Christmas. 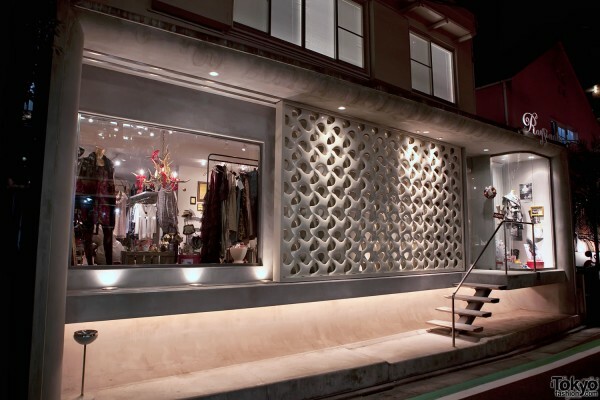 The cute new Biancheri Tutu lingerie shop on Cat Street. Balloons and hanging decorations inside of Annon Cook. 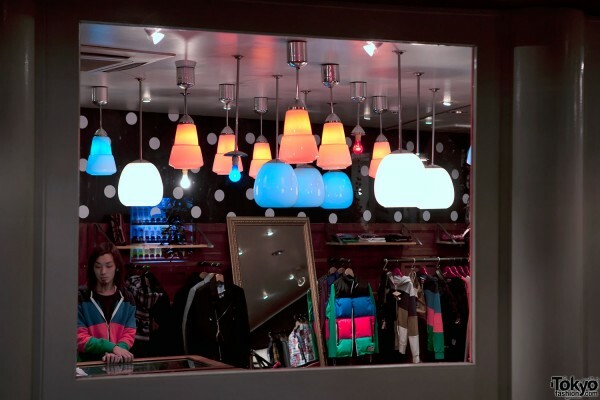 Beautiful hanging lamps inside of a shop on Cat Street. 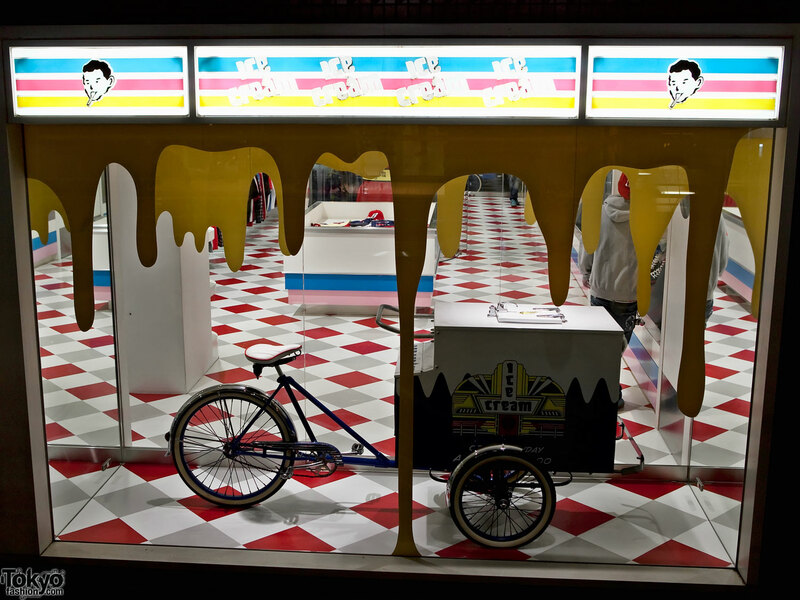 This shop looks a little empty. It’s getting late, so maybe that’s why. 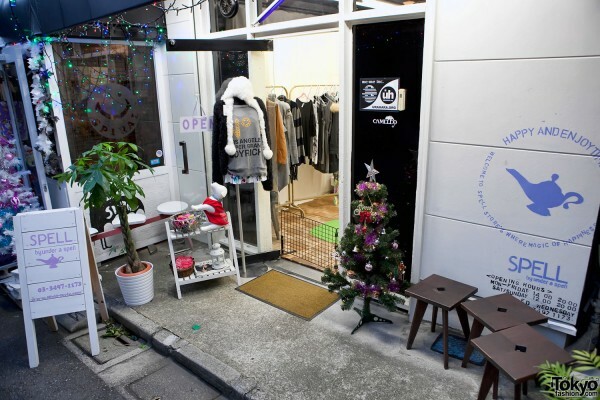 The W Closet Harajuku shop is pretty cute. Little Christmas trees outside of United Arrows District. 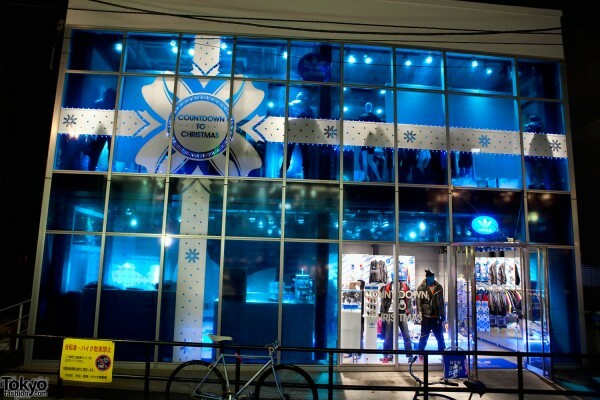 Adidas Harajuku’s “Countdown To Christmas”. Have I ever told you how much I love HP France? There is a really cool shop of theirs in Parco Shibuya called “Goldie”. Go there. Buy things. I did. 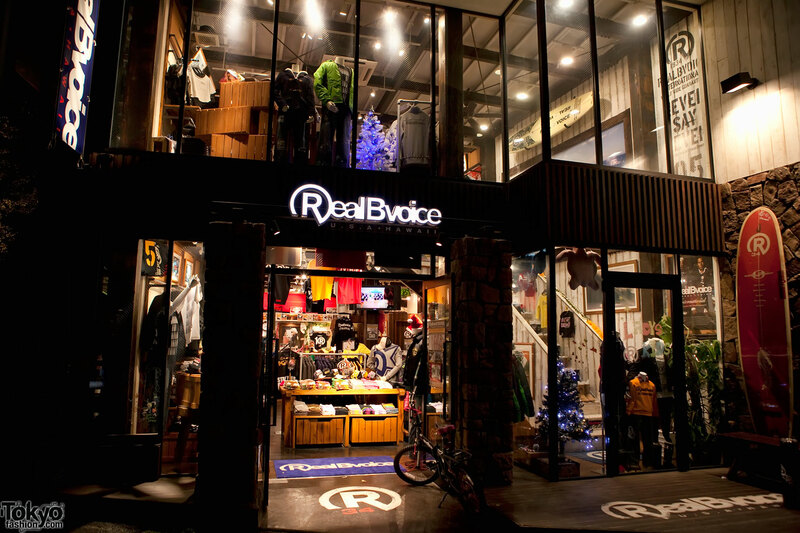 Body Wild is an underwear shop located in the old Nike Harajuku building on Cat Street. 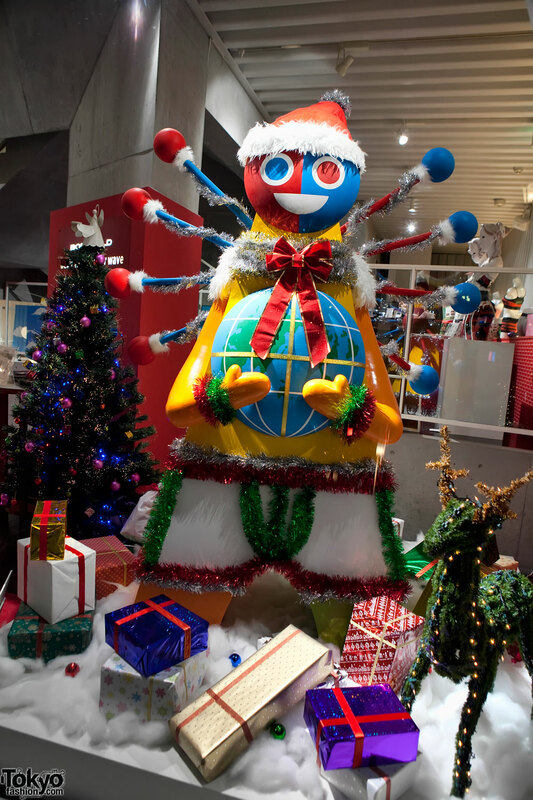 This is a Christmas monster in the window. A happy Christmas monster. If you want to eat takoyaki right on Cat Street, this is probably your best option. Don’t mind the line, it’s not always this busy! 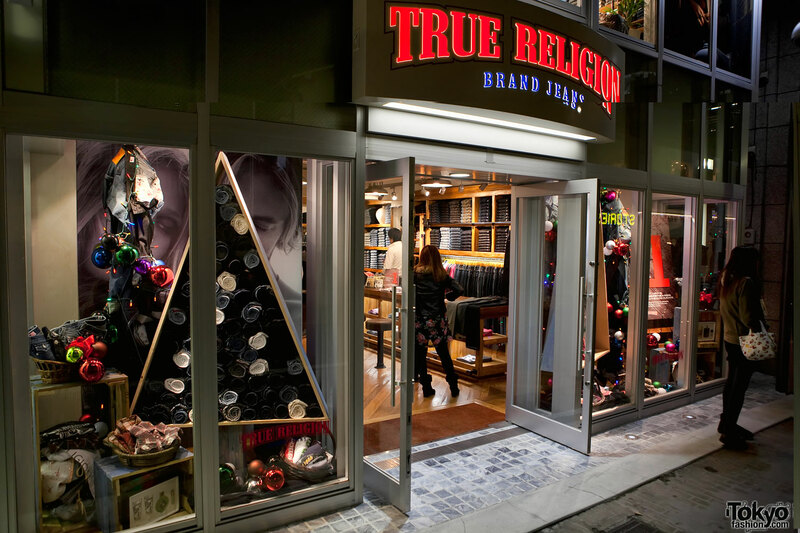 True Religion has a denim Christmas tree in the window. 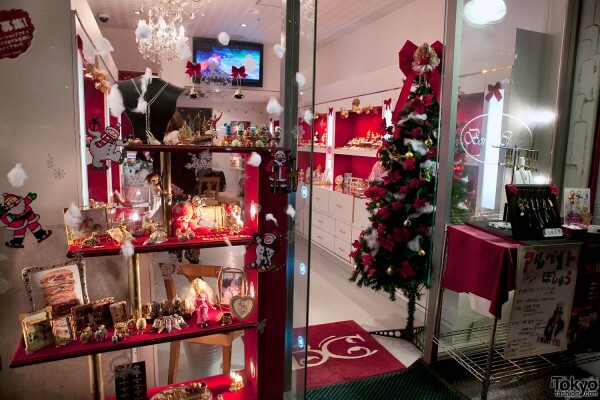 This shop opened this year. 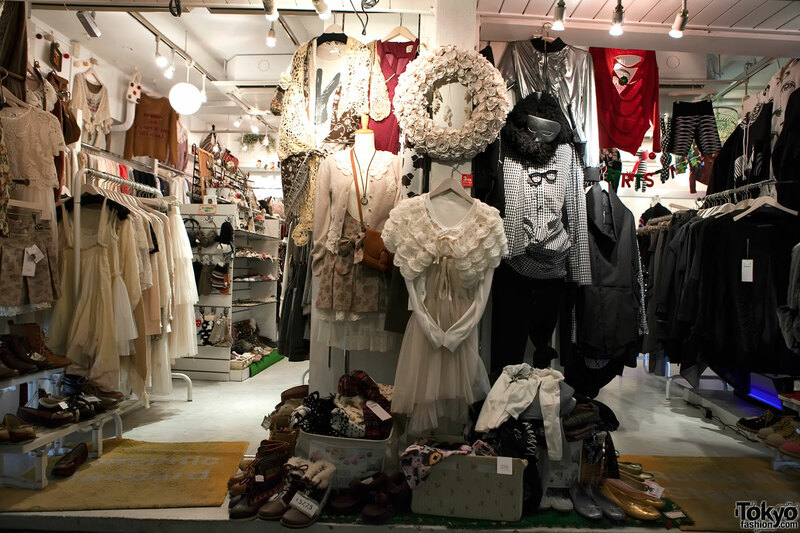 Cat Street Hearty X’Mas at Kiddy Land Harajuku. This is the new location on Cat Street while they are building a new Omotesando Dori store. Jewelna Rose. 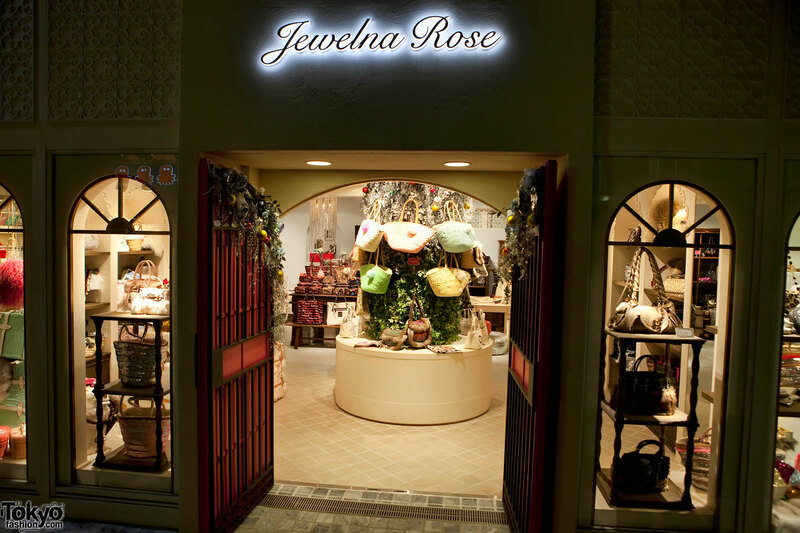 It’s a bag shop/brand. I’m pretty sure this is a Japanese company, even though the name may not sound like it. Samantha Thavasa is Japanese, too. The Lush Gorilla Perfume popup shop on Cat Street. It was like a haunted house filled with perfume. This building was the Calvin Klein popup shop last week, and it will be something else (or nothing) by the time you finish reading this sentence. 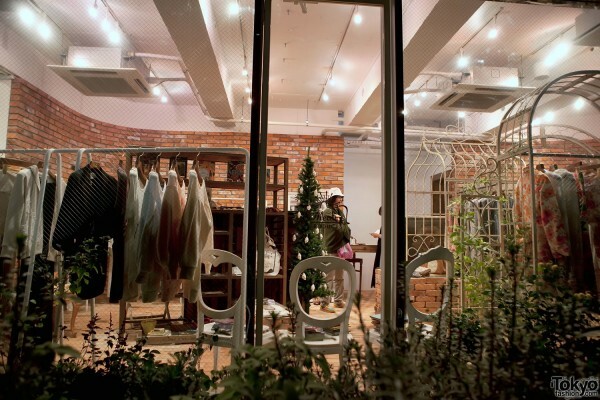 That’s the nature of popup shops. 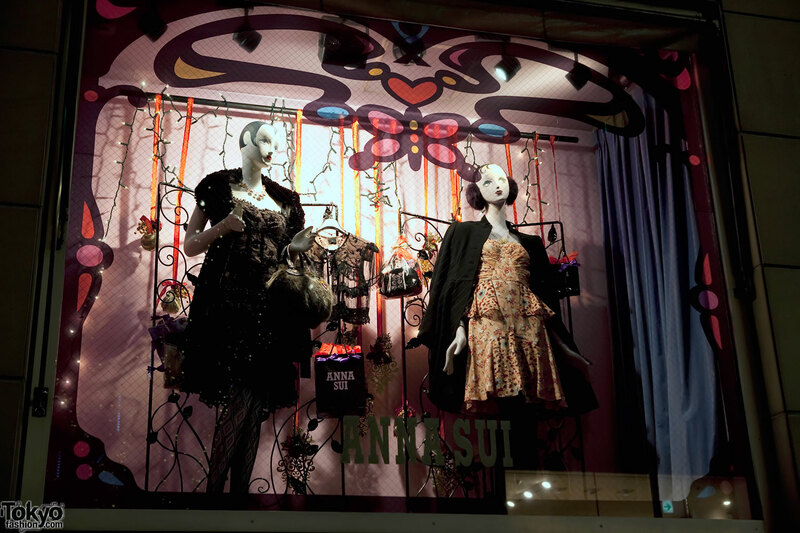 Anna Sui’s shops look like Christmas all year long. 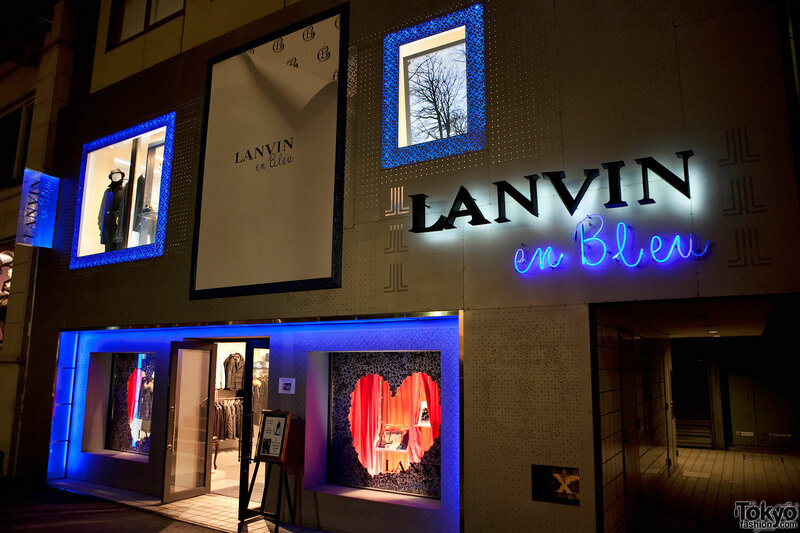 Lanvin en Bleu has several pretty Christmas windows. 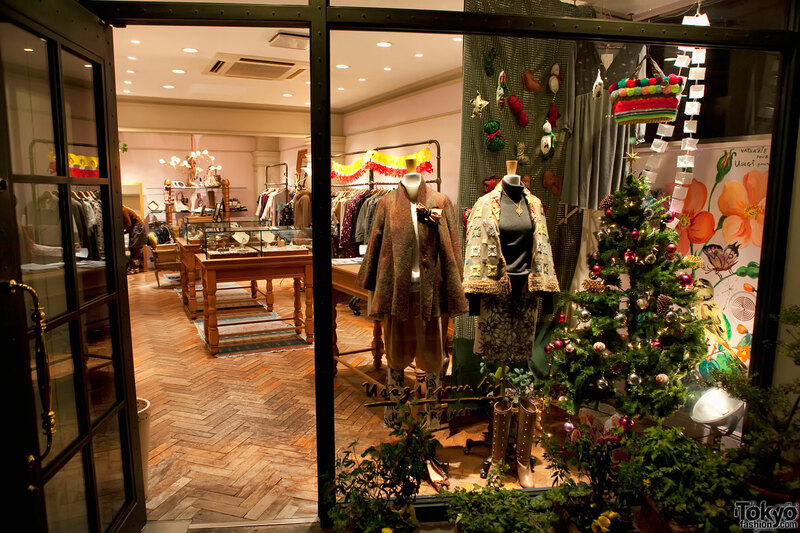 Look at that – we’ve made it back to Omotesando Dori! That’s the Dior Building and the Omotesando illumination. Too pretty. Does that mean our walk is over? No way! We’ve got to keep going down Cat Street on the other side of Omotesando Dori. After crossing the street, we rejoin Cat Street and continue our walk. 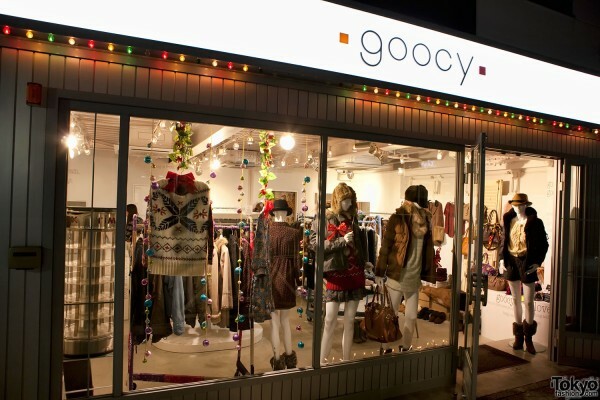 Here’s Goocy Harajuku. 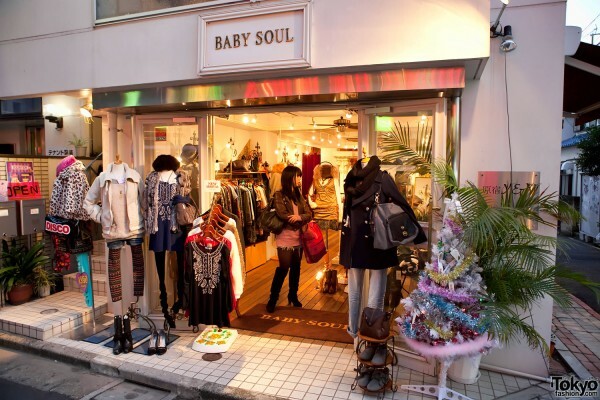 There are too many shops with cool names around here! 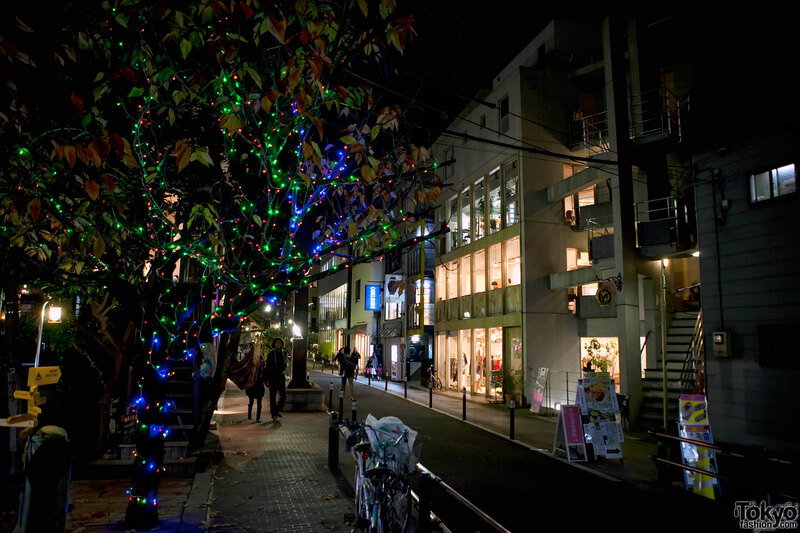 They have a special Cat Street illumination on this side of Omotesando Dori. 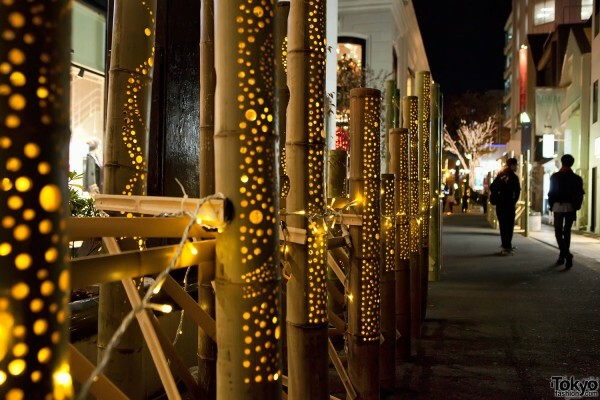 Rows of bamboo have been lit up from the inside. It’s really cool. I’ll try to get a better picture in a minute. 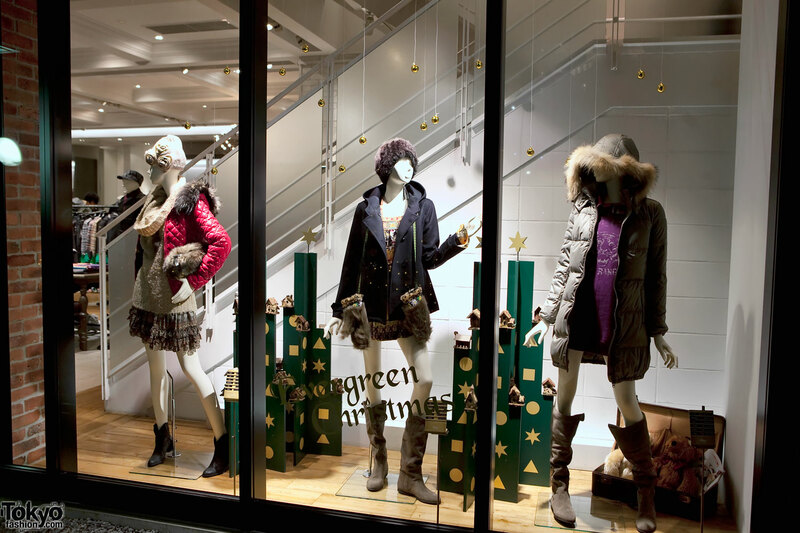 Evergreen Christmas at Ships Jet Blue Harajuku. 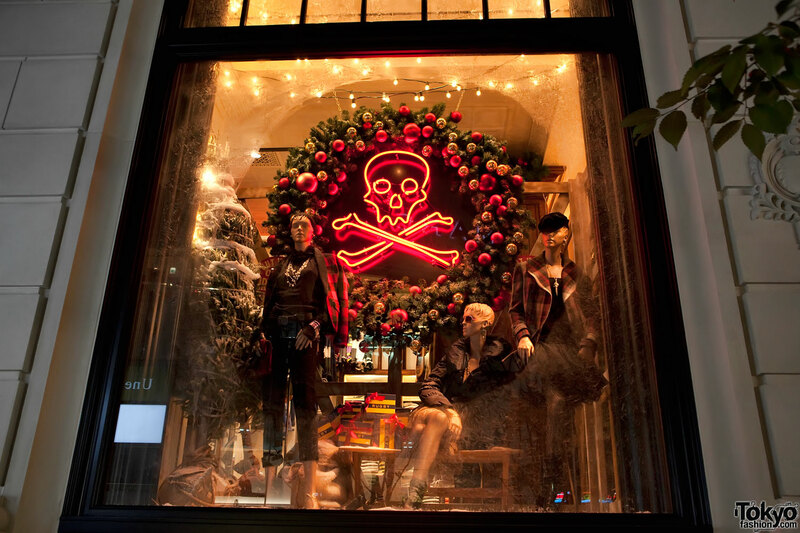 Happy skull Christmas at Ralph Lauren Rugby. 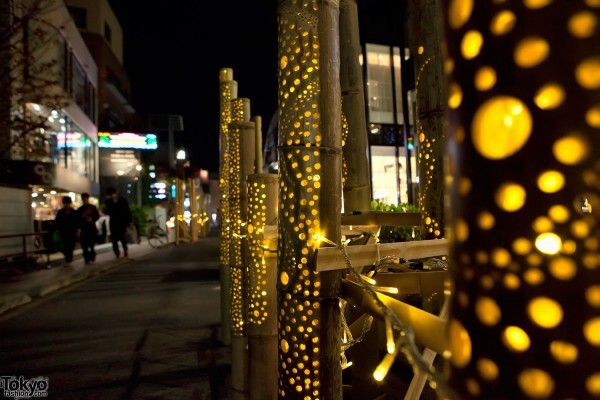 Here is a better picture of the lighted bamboo on Cat Street. In this photo, we are looking in the direction of Killer Dori. And more lighted holiday bamboo – this time we’re looking toward Omotesando Dori. Kid Blue Harajuku. When you need pajamas for the cold Tokyo winter, this is nice option. Polcadot – one of Cat Street’s many hat shops. Look, it’s Rody The Reindeer outside of Polcadot! 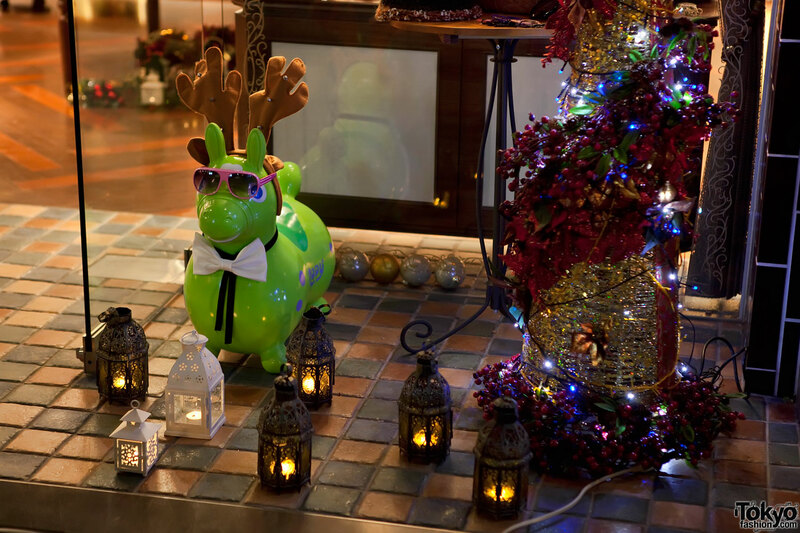 Do you know Rody? It’s a plastic horse character from Italy. I’ve seen more Rody here than I’ve ever seen in Italy or any other country. 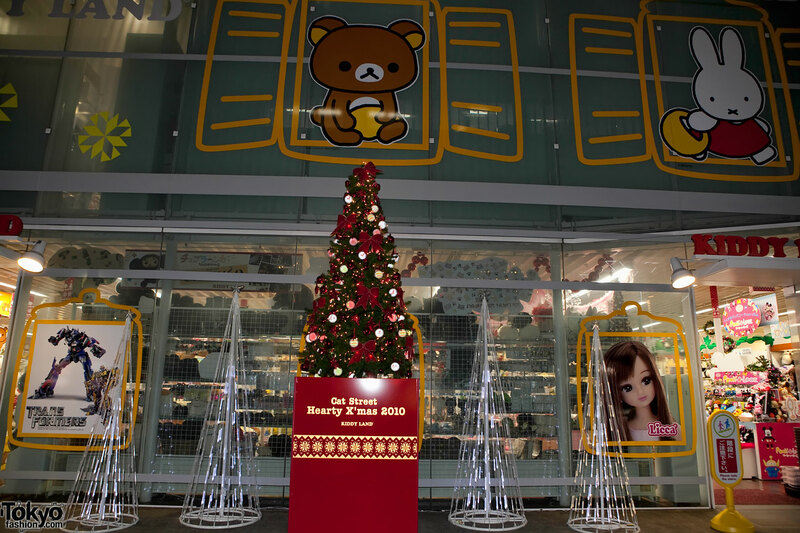 Not sure why, but Japan seems to be in love with Rody. I have to admit, he’s pretty cute. 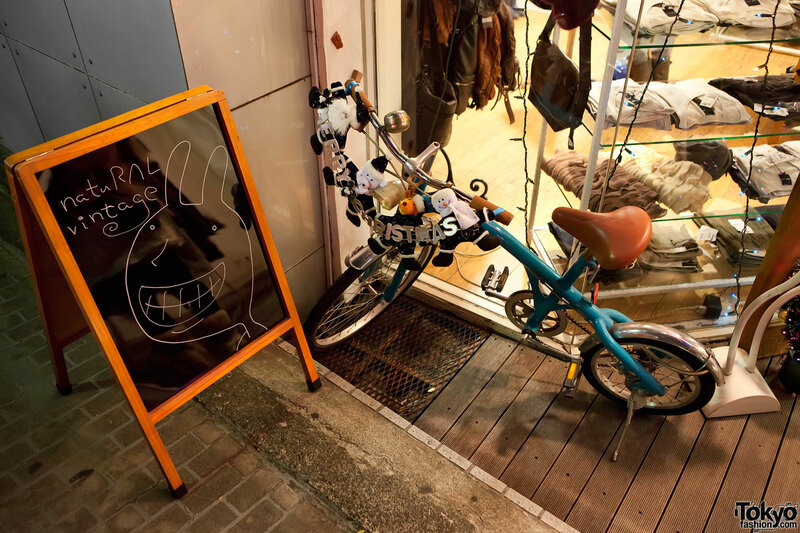 A cute hand-drawn sign, and a bicycle with “Merry Christmas” on the handlebars. Two Japanese girls laughed at me while I was taking this photo, but they were nice. 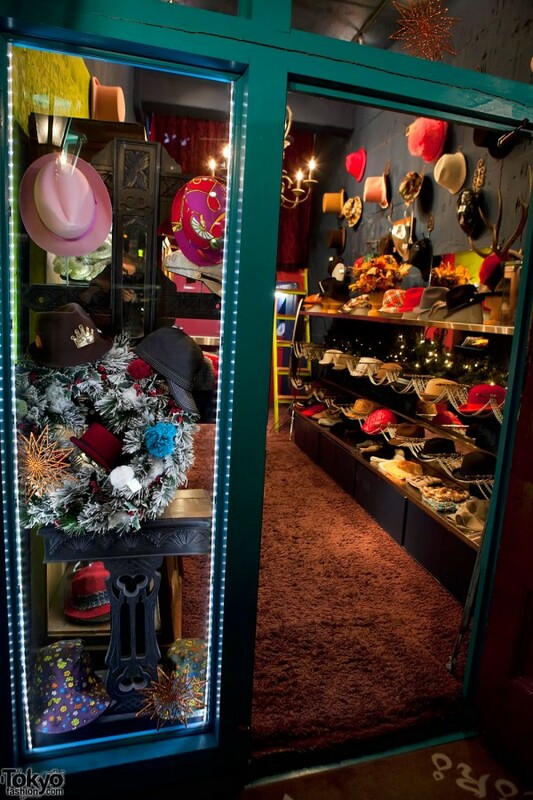 The iconic Candy Stripper shop on Cat Street. Whoever designed the front of this store did a good job. 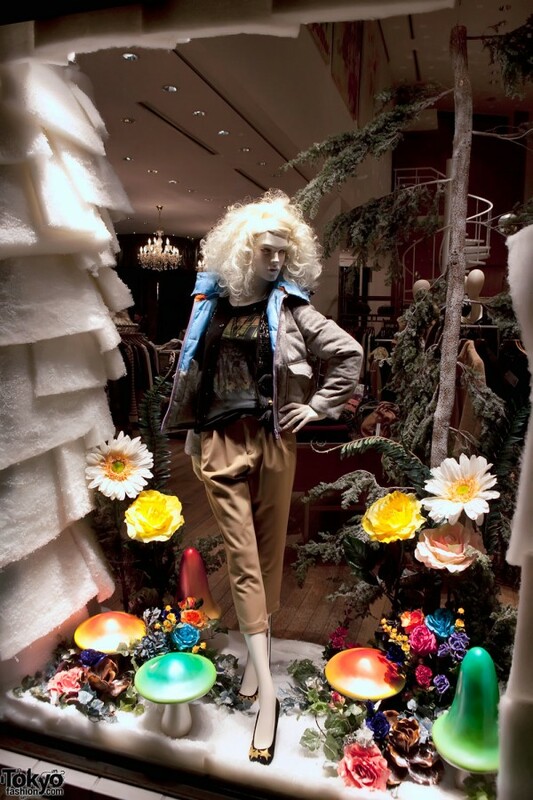 The Candy Stripper Christmas tree and some holiday fashion that you’d recognize instantly on the street as coming from this brand. X-Girl Harajuku with a Christmas tree inside. This is the Pariero Mart pet goods shop on the corner of Cat Street and the street that turns into Takeshita Dori. If you turned left off of Cat Street here, you could walk all the way to Harajuku Station up Takeshita. You could. But we won’t. Continuing down Cat Street, we see the Putumayo and H. Naoto shops. The location of these shops right next to each other is really convenient if you are into gothic fashion. In case gothic isn’t your speed, how about urbanwear at RealBVoice? Another Edition Harajuku and a big mushroom! Now we’ve entered the part of Cat Street that’s been hit hardest by the economic downturn. 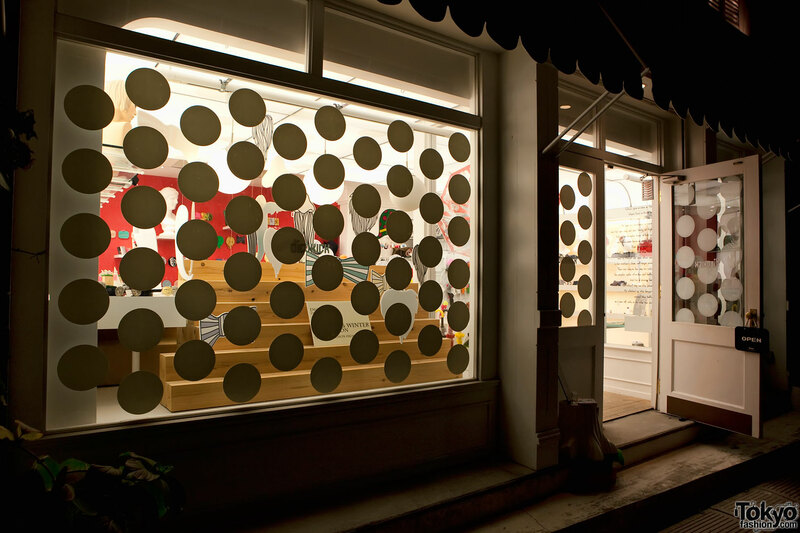 Many storefronts in this area are empty. 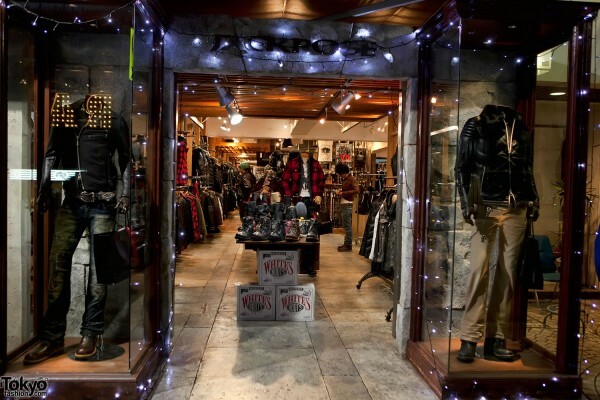 We could have taken photos of a bunch of dark empty stores, but that wouldn’t be very fun would it? 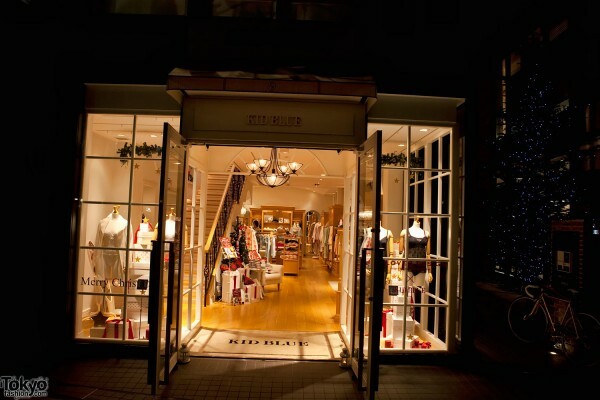 Let’s pass by these stores, and hope for better times in 2011! 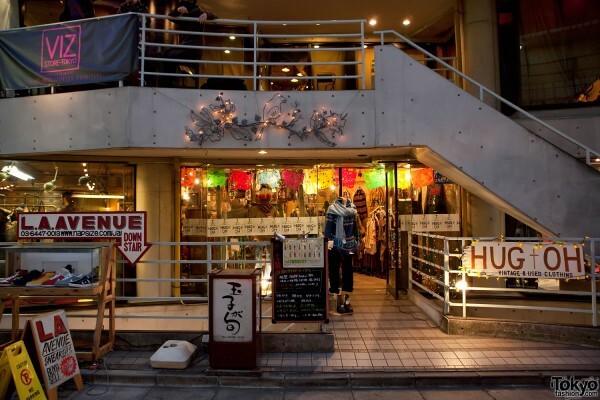 Here is a survivor – the cute Scolar Harajuku store. Speaking of cute, it’s Dicokick! 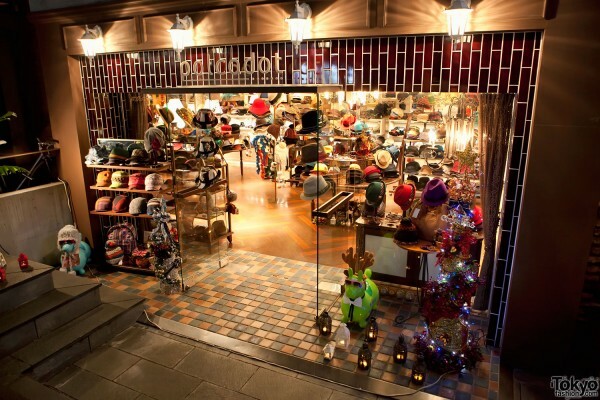 If you go to Harajuku, and you’re into quirky accessories, I recommend that you don’t miss this shop. They create artistic, original, and sometimes bizarre jewelry, hair accessories, phone charms, and other random stuff. 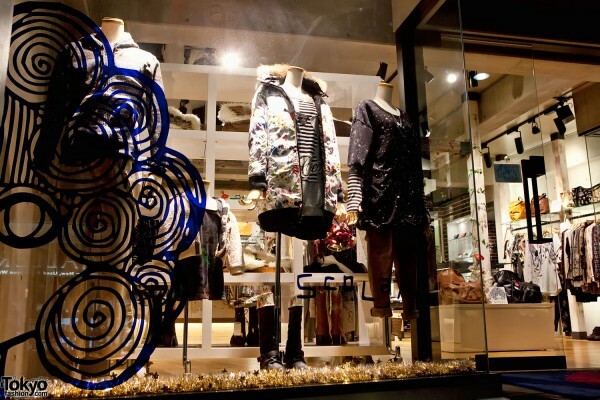 Some of their collections are done in collaboration with outside artists, but many are done by their own designers. If you want to visit a shop that’s very “Harajuku”, check out Dicokick! 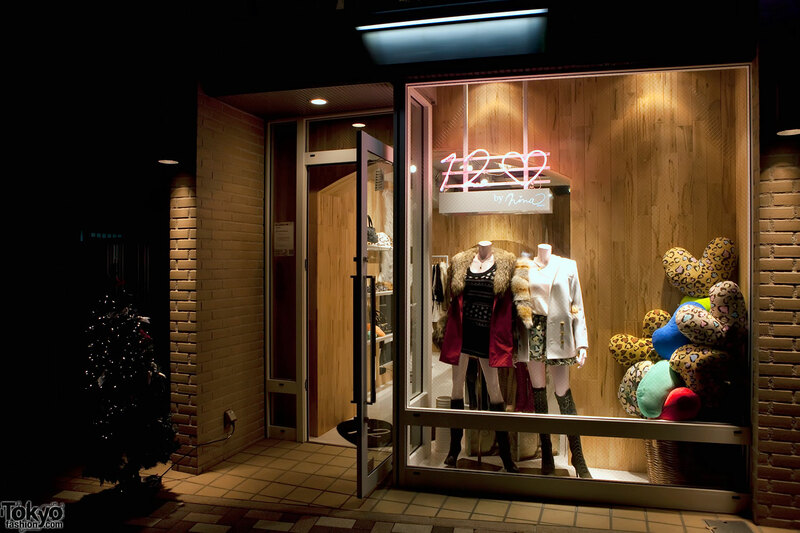 The Raffinato Harajuku building looks cool, and the shop carries some cool fashion. 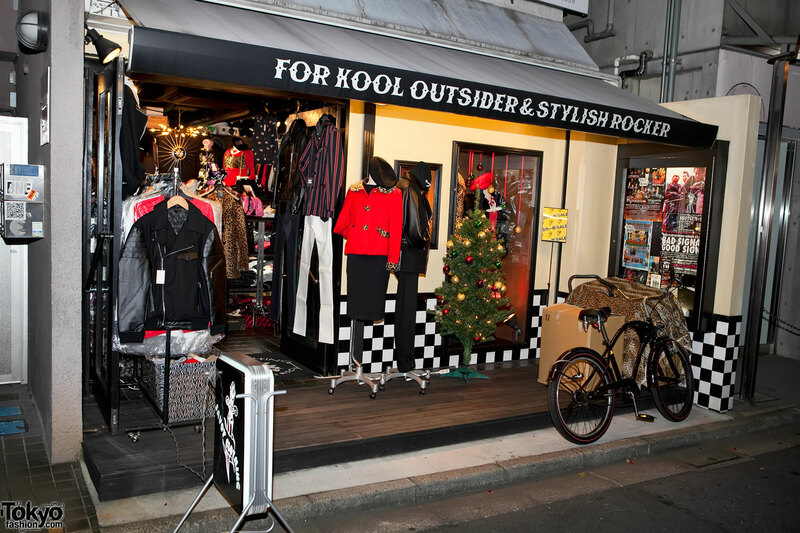 Kool Outsiders and Stylish Rockers love Christmas too! 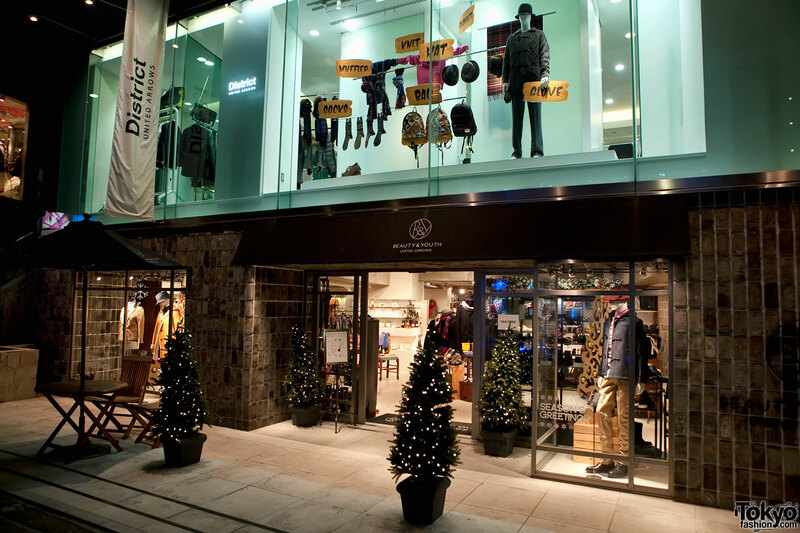 Savoy Clothing with a Christmas tree out front. 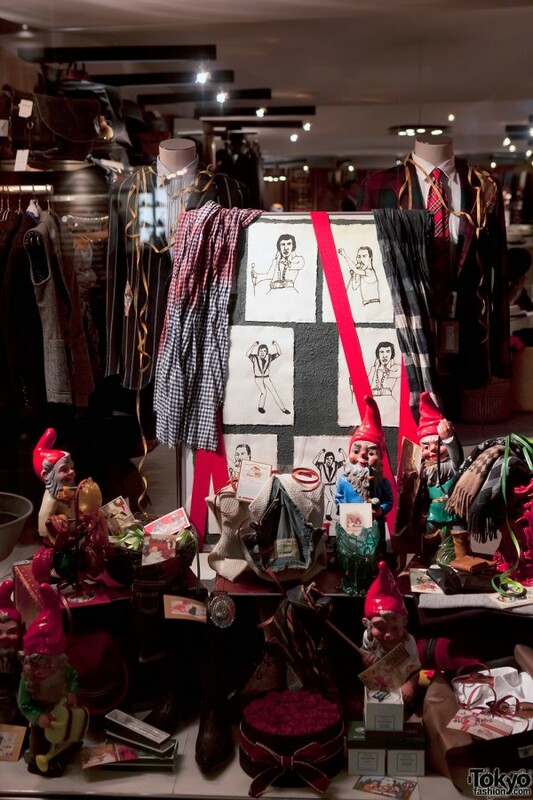 This photo features lots of elves, along with Michael Jackson, Elvis, and Freddy Mercury. If that doesn’t put you in the Christmas spirit, nothing will! Hey, this looks a lot like…yes, it is…Killer Dori. Wow, we’ve made it all the way back to where we started. If we spin around 180 degrees, we can see the Diesel Harajuku shop from here. You know what that means? We’re done walking for tonight! Thank you all for joining us on this long-but-fun Harajuku holiday photo walk. 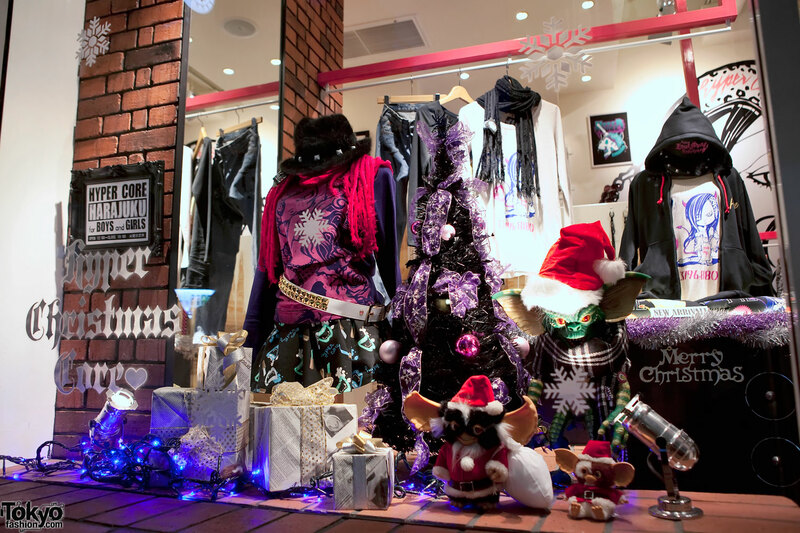 If you missed part one of our Harajuku Christmas walk with Takeshita Dori and LaForet Harajuku, check it out now! 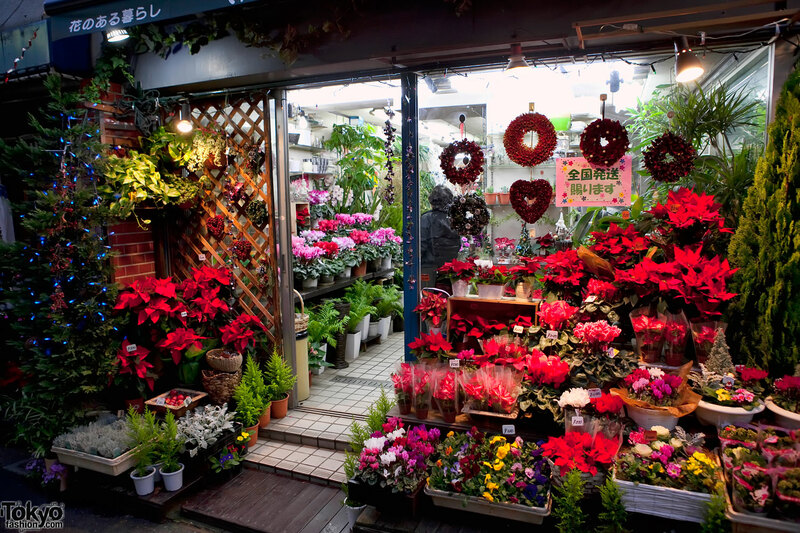 Also, don’t forget to view our other Christmas photo walks including Shibuya, Shinjuku, Roppongi, and other Tokyo neighborhood. Wow! 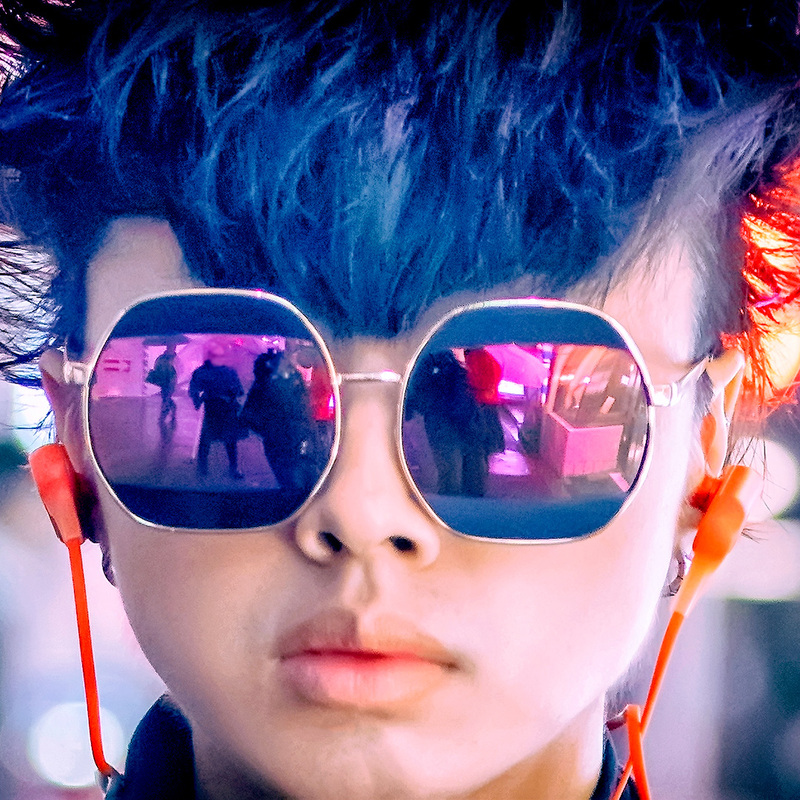 The photo’s are amazing! Thanks for posting this! I really wish I could be there for Christmas….hopefully next year. Thanks, again! 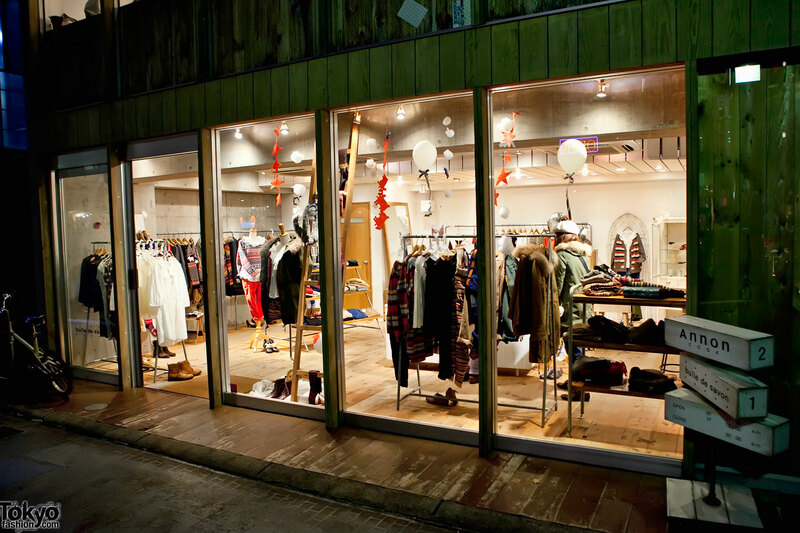 Tokyo stores and boutiques RULE! 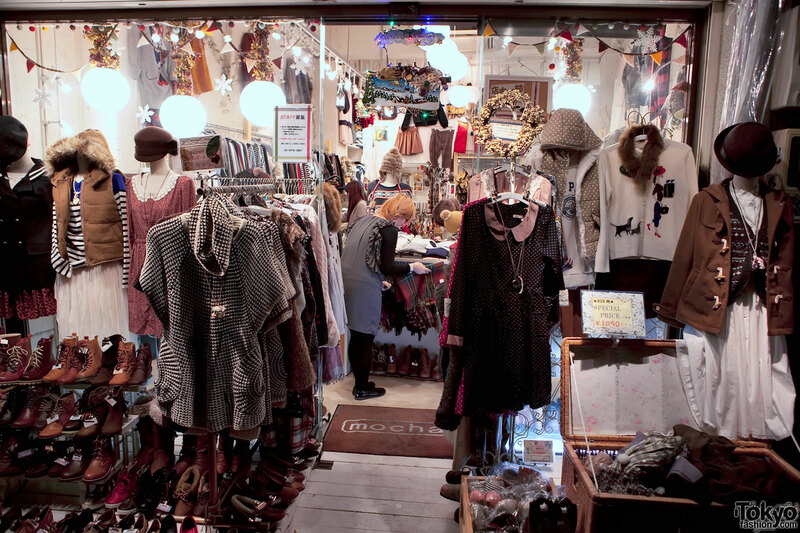 Especially the ones in Harajuku. So do your photowalks. Thanks for letting me trek through Tokyo with TF (virtually this year)! !